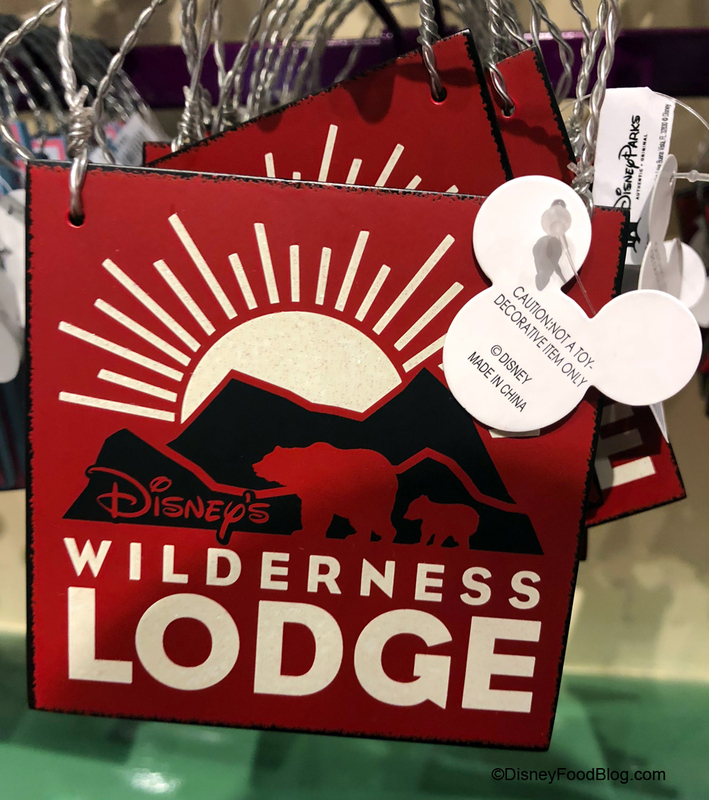 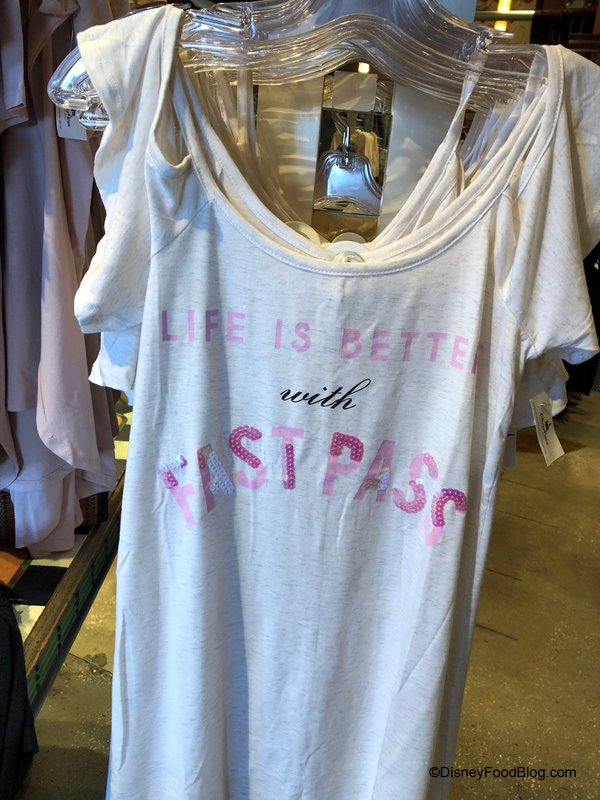 Disney Springs’ newest retail location DisneyStyle is staying on-point with their trendy, stylish merchandise. 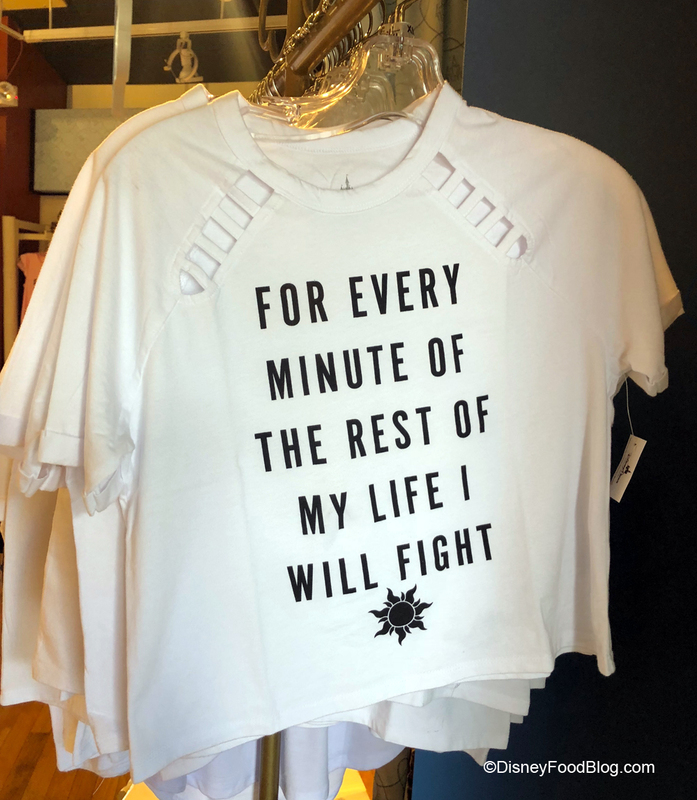 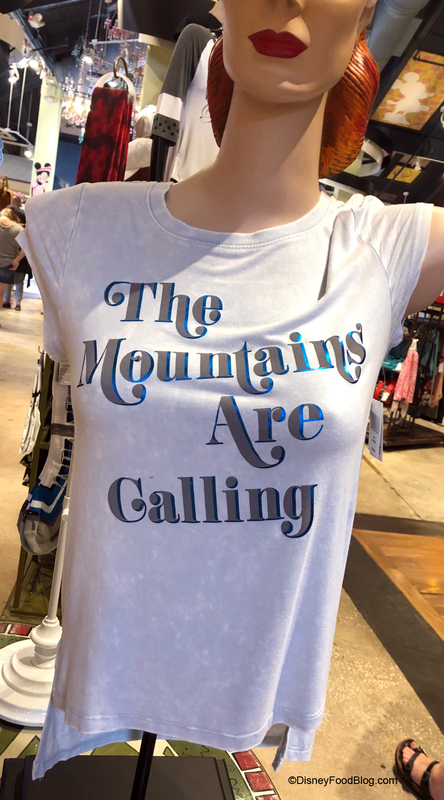 They have added some more Insta-worthy shirts to their line up. 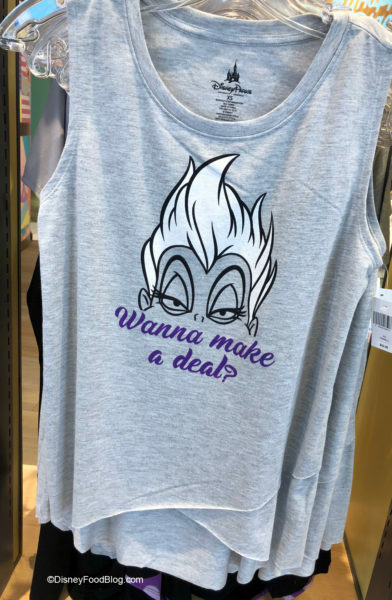 Umm, no Ursula we don’t want to make a deal! 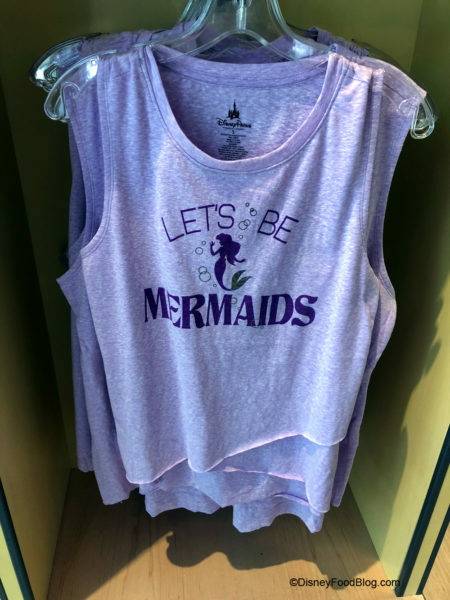 This is our preferred Little Mermaid shirt. 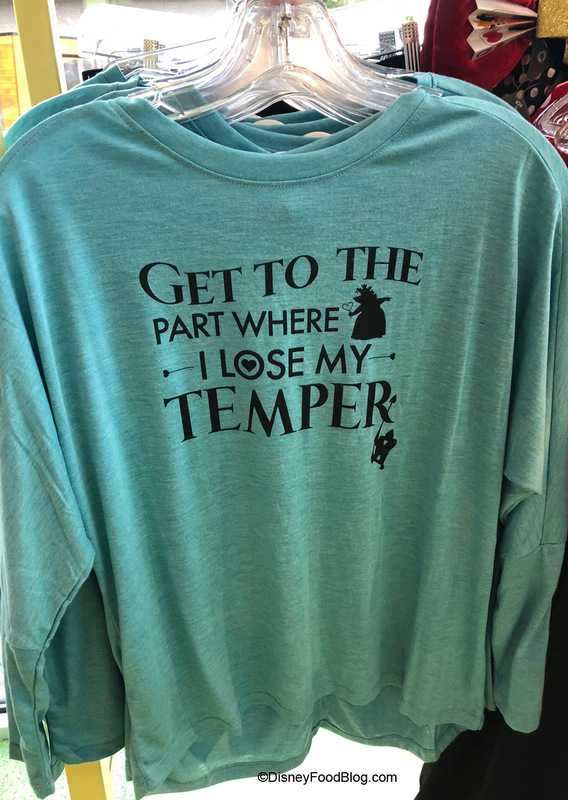 Just in case the Evil Queen is doing a little Summer shopping… . We all have those Queen of Hearts days! 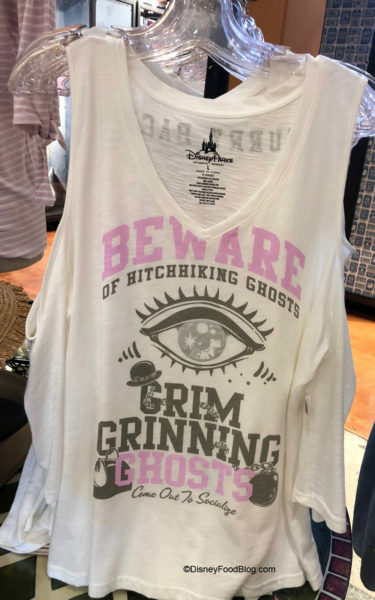 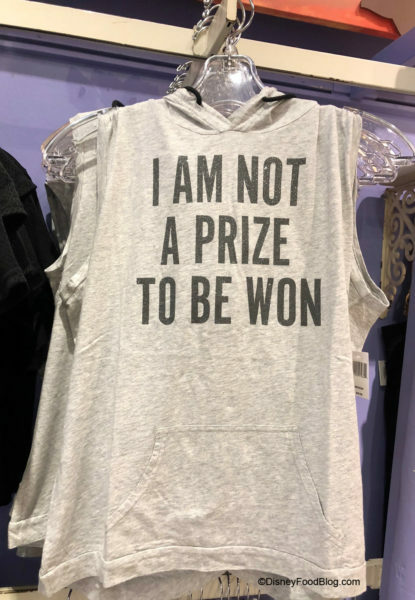 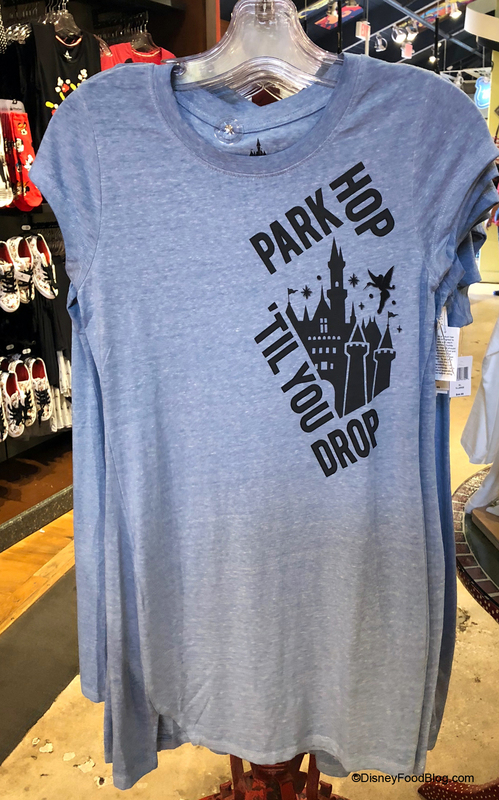 Of course, at Disney Food Blog, this is our must-purchase shirt! 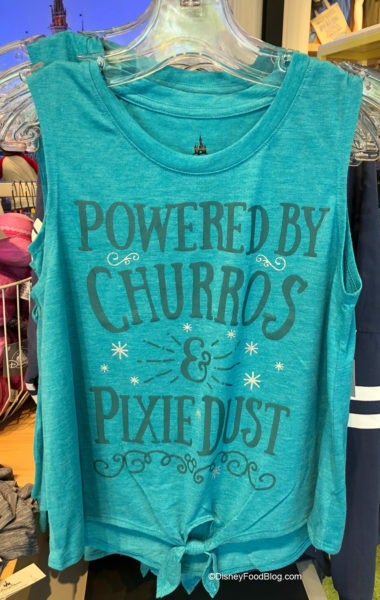 Who Isn’t Powered by Churros? 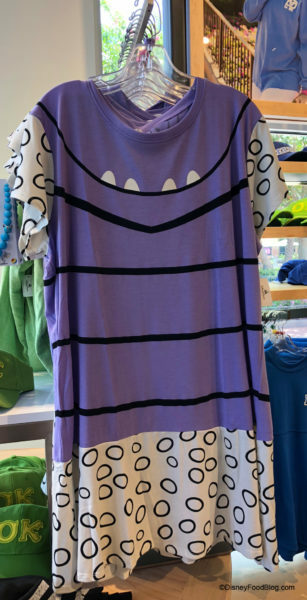 This adorable Boo shirtdress might be my Halloween costume this year! 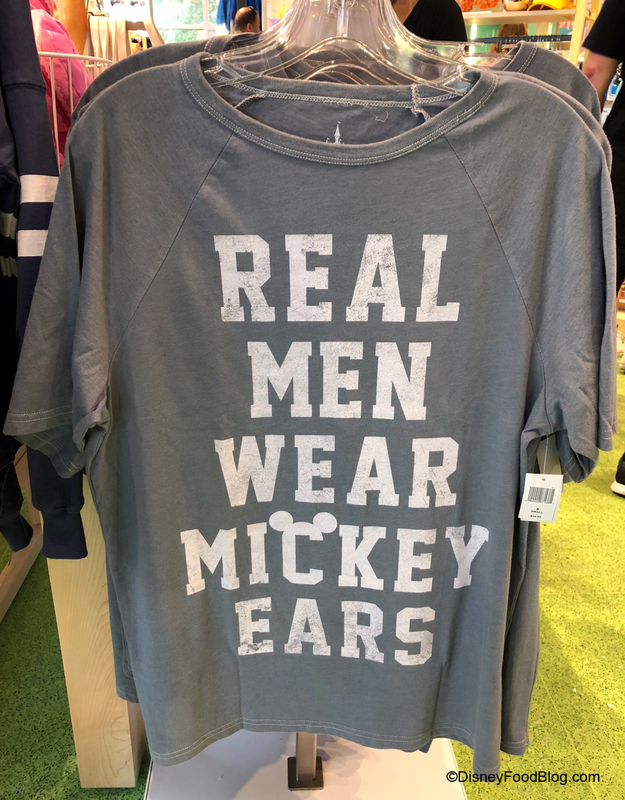 Finally, for the men out there – a returning favorite just for you. 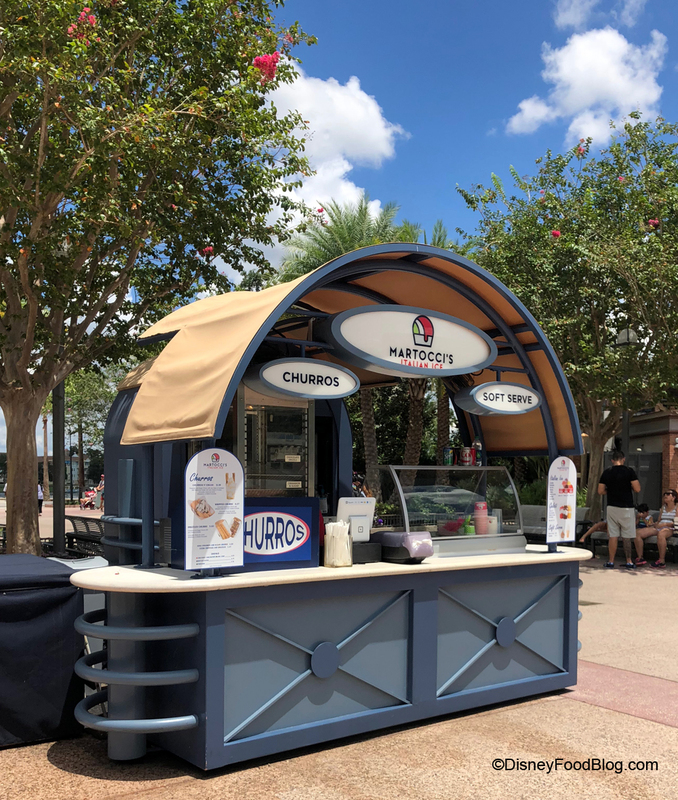 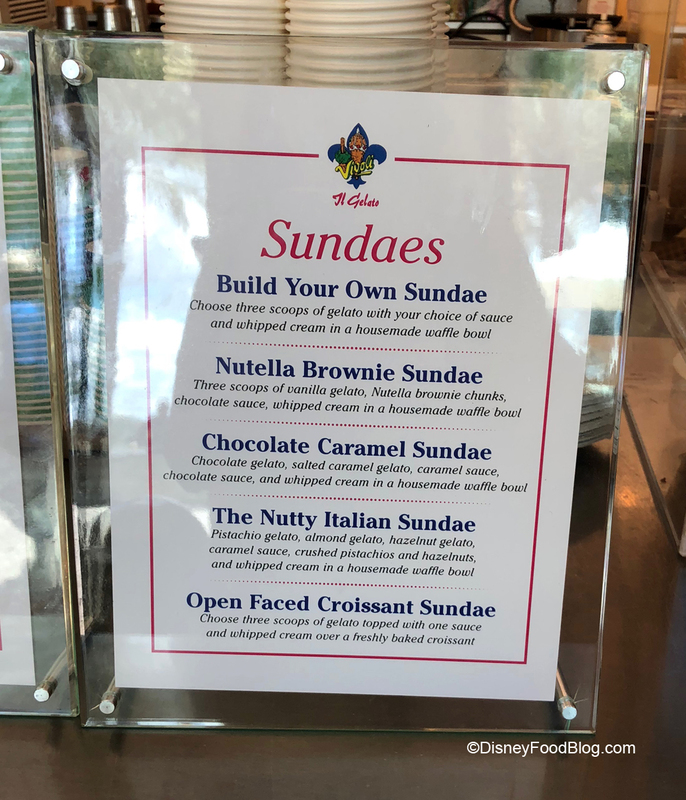 Martocci’s Italian Ice Stand is offering a new Churros n’ Cream Sundae as well as a Whipped Churro (yeah, it’s not what your thinking…whatever it is that you’re thinking). 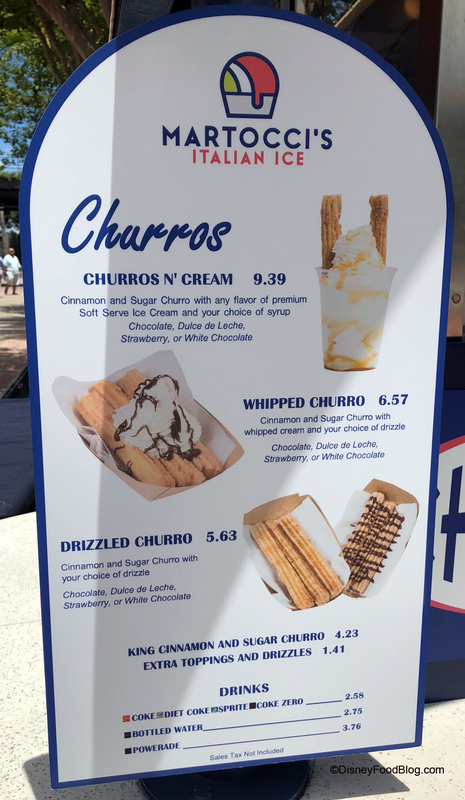 The Sundae is your choice of soft serve ice cream flavor and syrup flavor including chocolate, Dulce de Leche, strawberry, or white chocolate accompanied by Churros. The Whipped Churro is made up of Churros topped with whipped cream and your choice of syrup drizzle (not nearly as exciting as you imagined, right?). 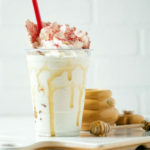 Haagen Dazs Ice Cream is offering two new milkshakes: Sea Salt Caramel Truffle and Banana Peanut Butter Chip. YeSake Kiosk has brought in the Frozen Kirin Draft Beer. Note that frozen beer isn’t actually frozen…or even slushy. It’s regular beer with a “frozen head” to make it stay cooler longer. 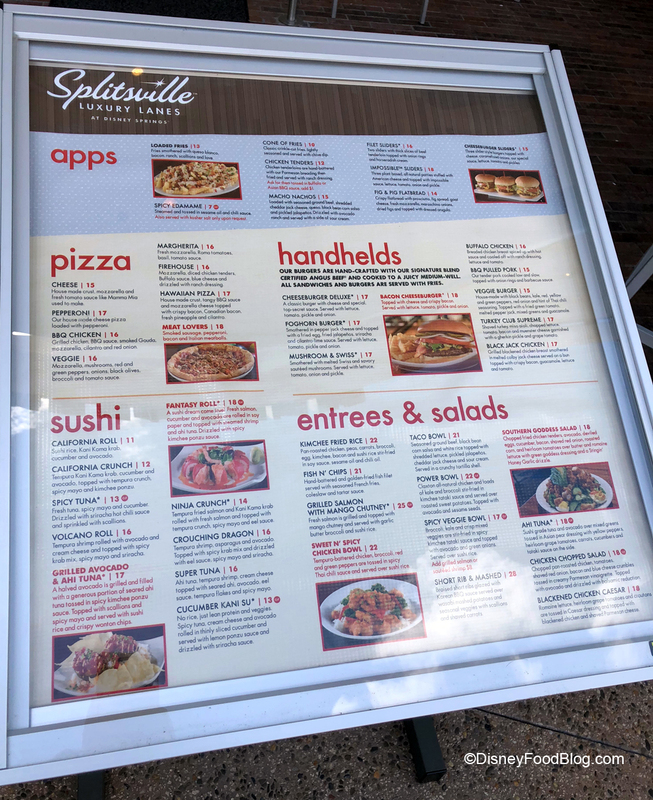 The team at Splitsville Luxury Lanes has been working on their menu and have added some new items: Impossible Sliders, Fig and Pig Flatbread, Kimchee Fried Rice, Short Rib and Mashed, and Southern Goddess Salad. We took a moment to check out the progress on the two new additions coming to the West Side: the NBA Experience and Jaleo. 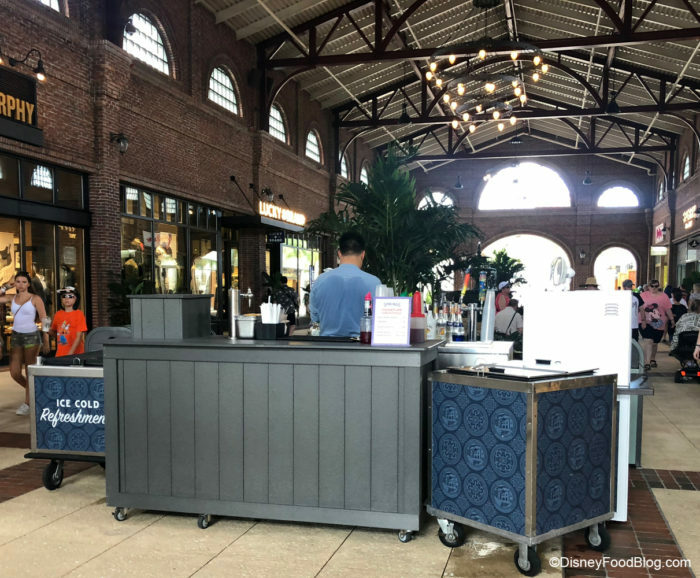 Jaleo will be a table service Spanish restaurant from Chef José Andrés with a grab-and-go window. Opening is expected in 2018. The NBA Experience (in the former Disney Quest area) is expected to open in Summer, 2019. 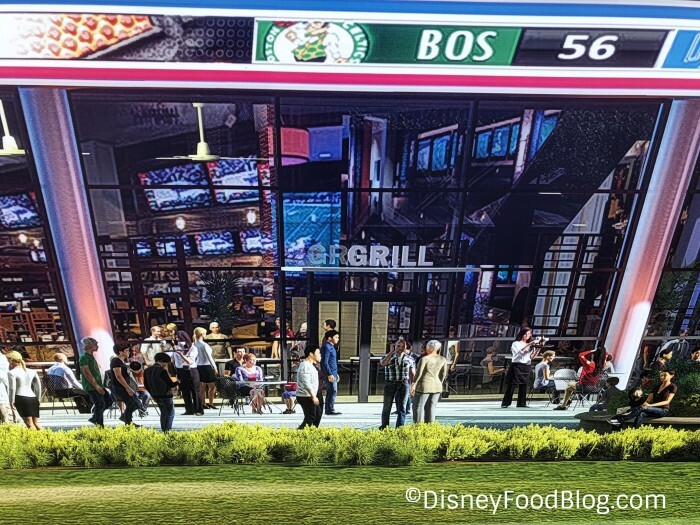 Here’s some concept art so you can imagine with us when the NBA Experience will look like a year from now! 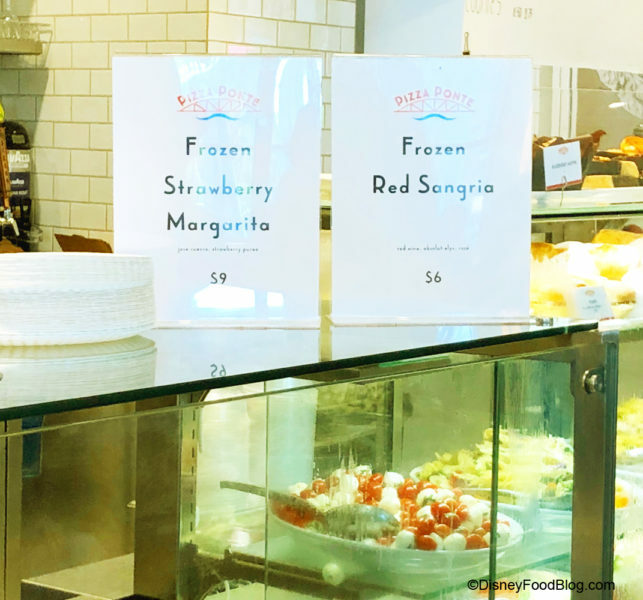 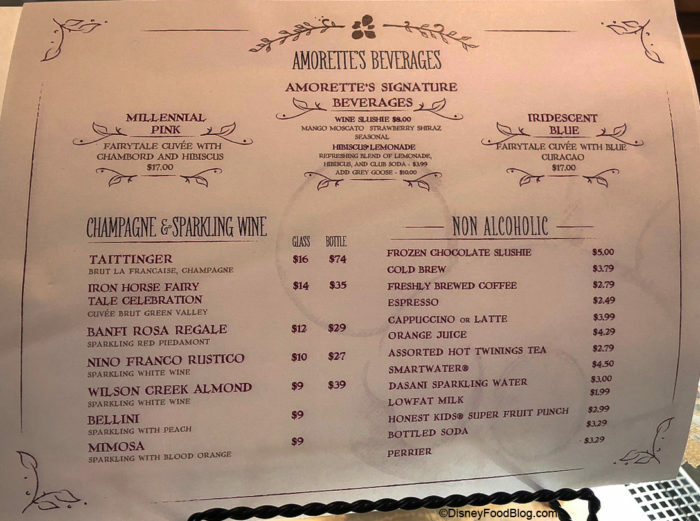 Pizza Ponte is now serving some seasonal frozen drinks: A Frozen Strawberry Margarita and a Frozen Red Sangria. 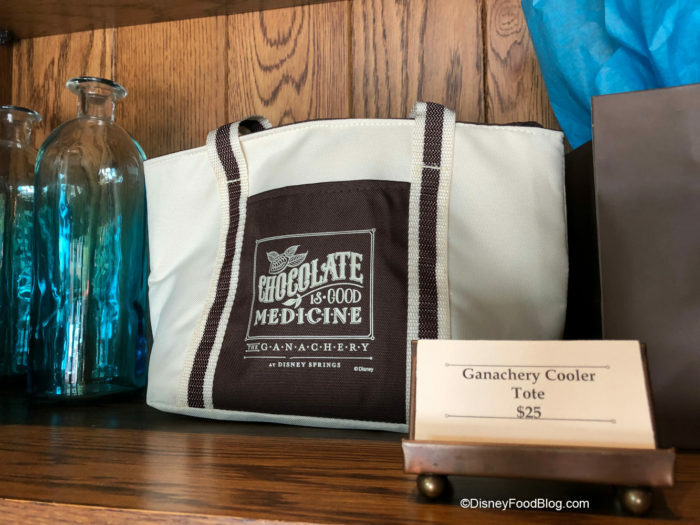 The Ganachery is now selling small cooler bags. 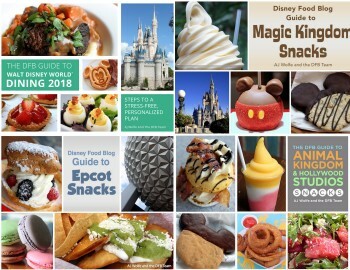 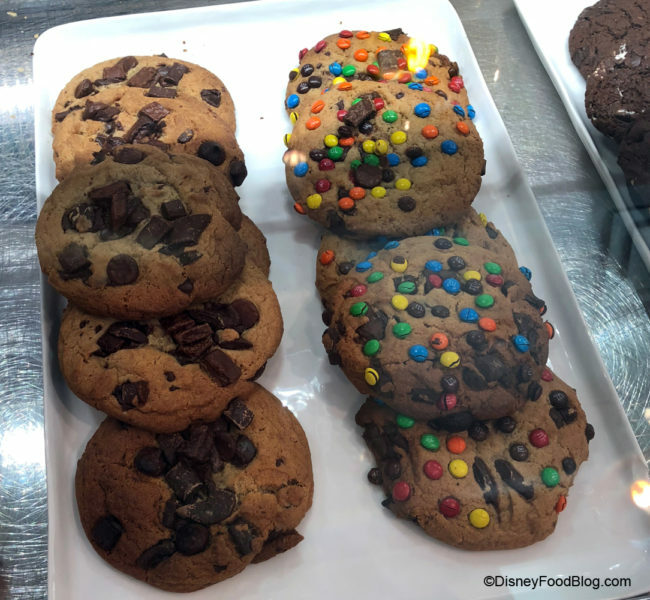 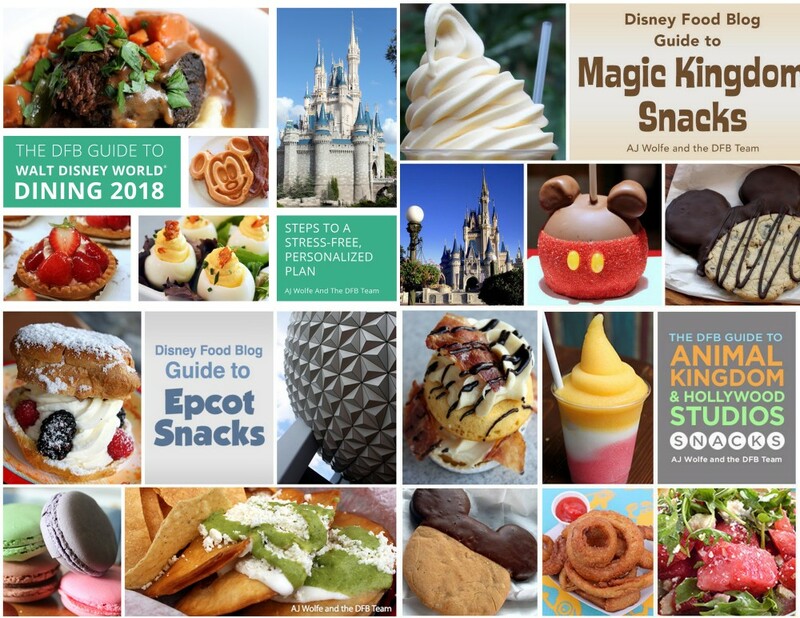 These can work to help you get your Granachery treats home in one piece and can then double as a lunch bag “in real life” (that life we all have to fund our Disney life). Wine Bar George is offering a fairly new lunch menu that includes a chicken salad sandwich, BLT+C (the “C” is cheese sauce! 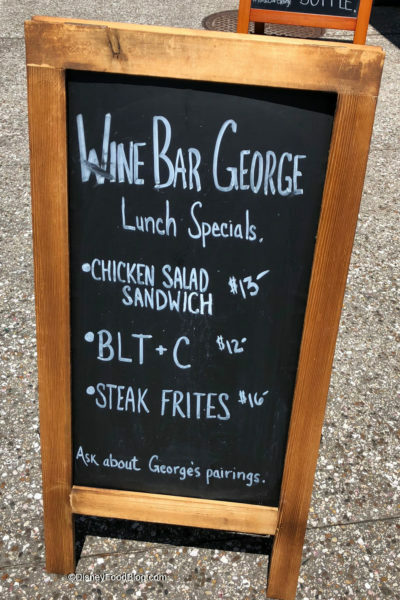 – a man after my own heart), and steak frites. 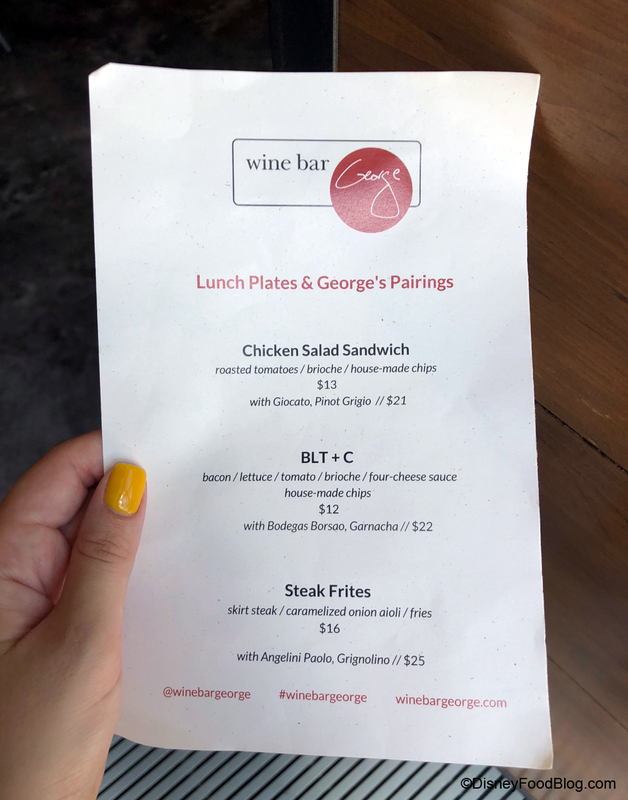 Of course, Master Sommelier George Miliotes has some recommended wine pairings with each item. 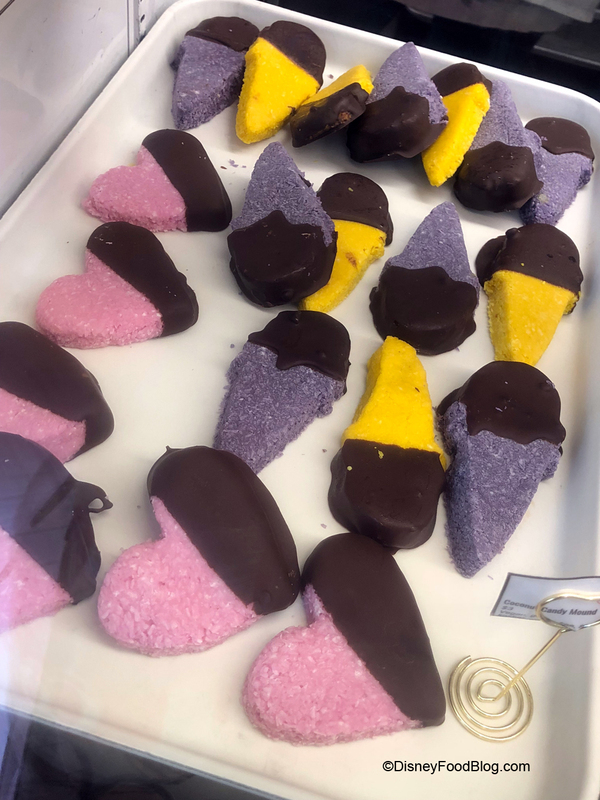 If you need some gelato to beat the heat stop in at Vivoli il Gelato for some creative treats. 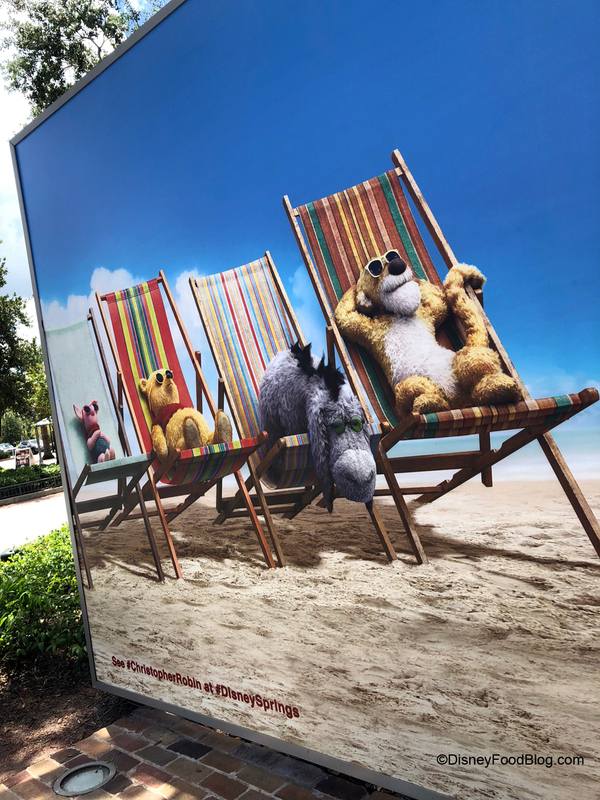 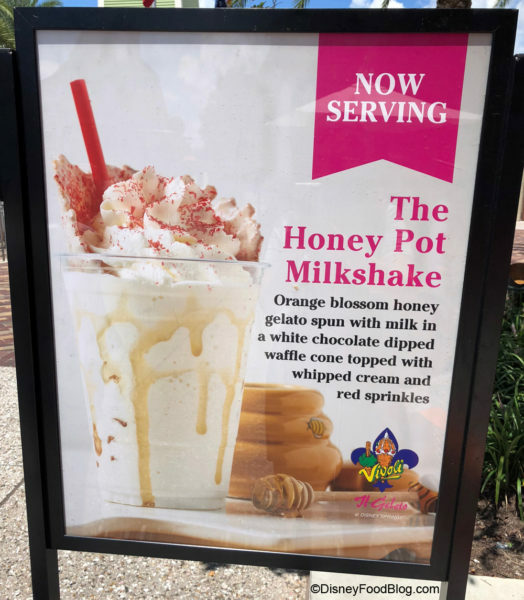 To celebrate the opening of Christopher Robin they have the Honey Pot Shake. The Open Face Croissant Sundae has been added to the Sundae options. Plus, they are now offering house-baked cookies at Vivoli il Gelato. 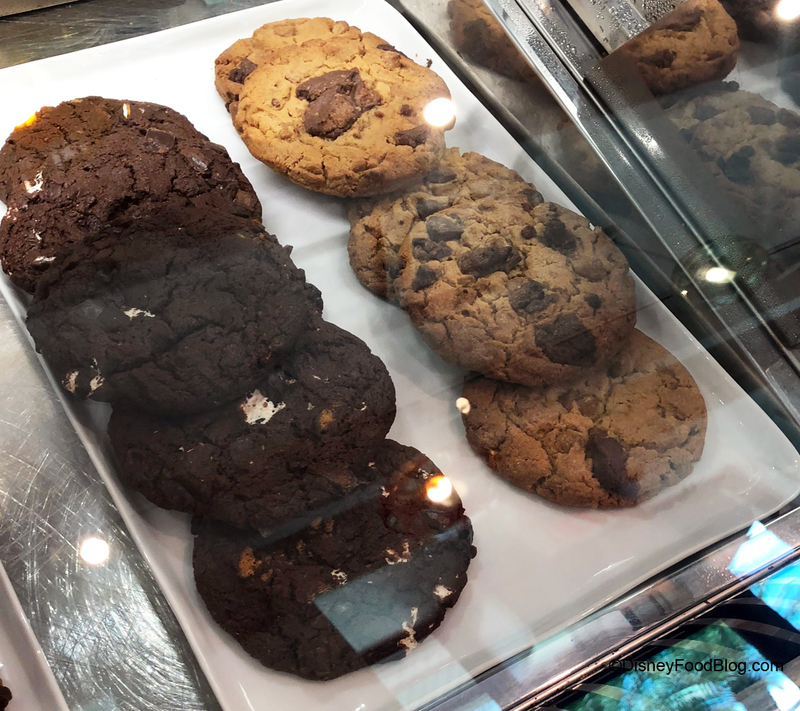 So…feasibly you can make a gelato cookie sandwich?!? 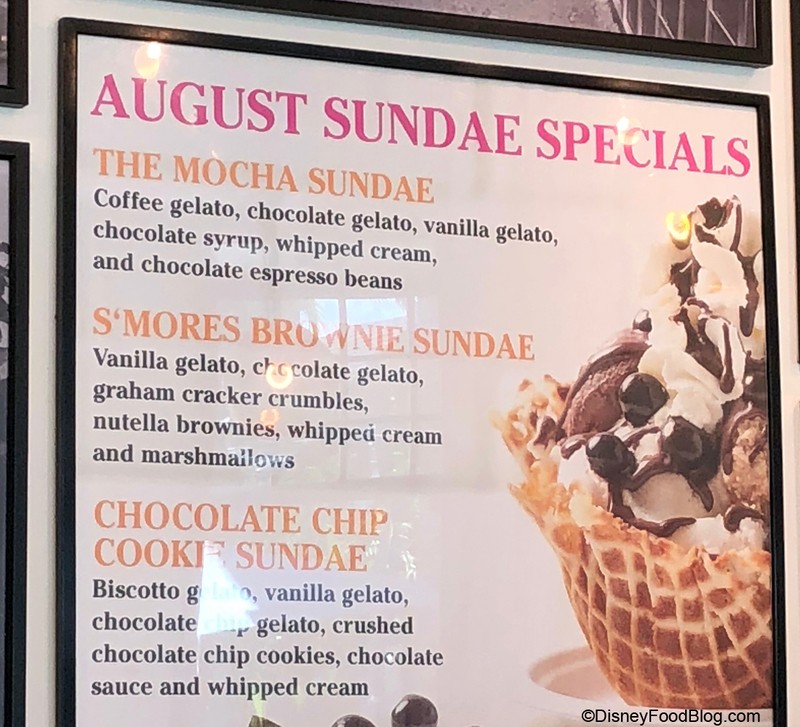 The August Sundae Special Menu is available in addition to the sundae menu show above. 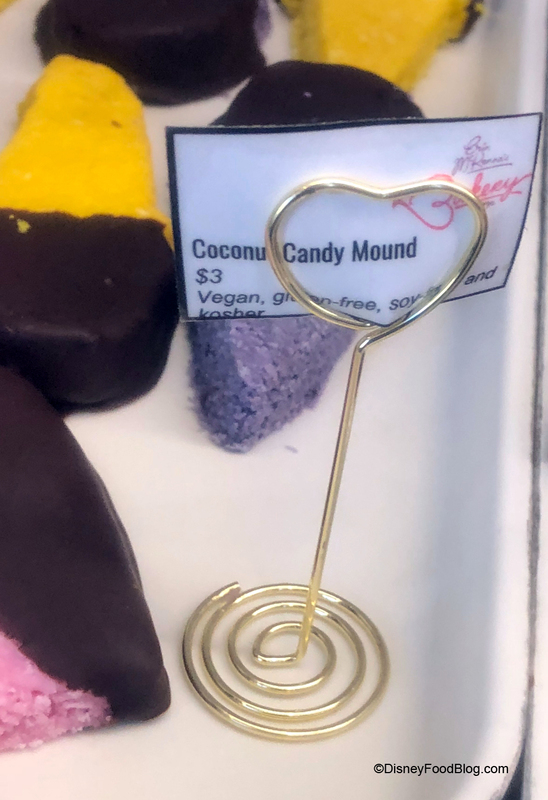 Erin McKenna’s Bakery NYC has some seasonal Coconut Candy Mounds in fun colors and shapes – all dipped in chocolate. 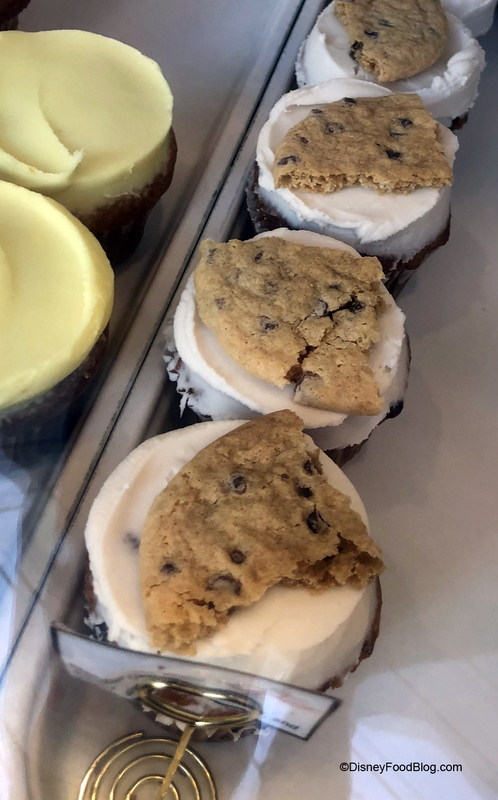 They also have Chocolate Chip Cookie Cupcakes. 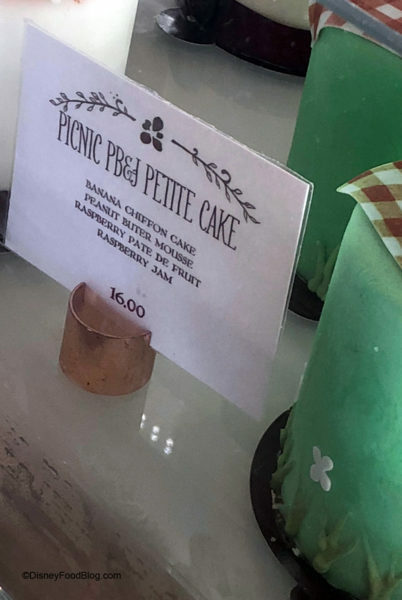 As always with Erin McKenna’s they can accommodate many food allergies or sensitivities. Be sure to ask when you stop there. 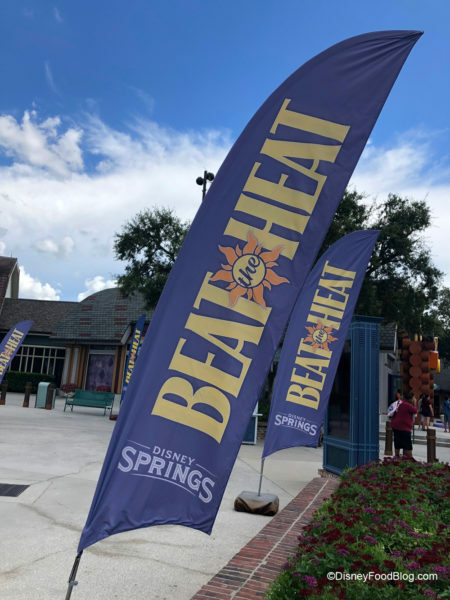 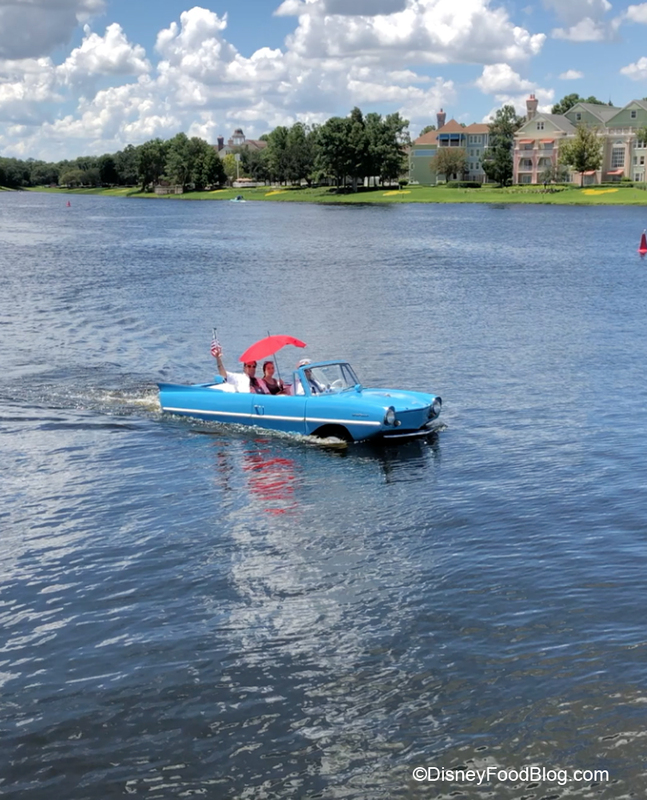 If you’re thinking of hitting the water to beat the heat head out for a Boathouse Amphicar Tour – they now offer sun umbrellas to let you tour in the shade – or full sun, your choice! 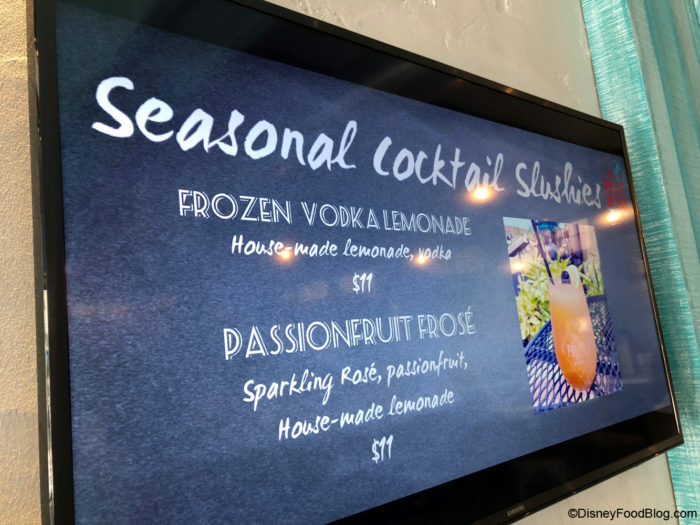 Florida Snow Company has added Signature Flavor Combinations to their shaved ice menu. 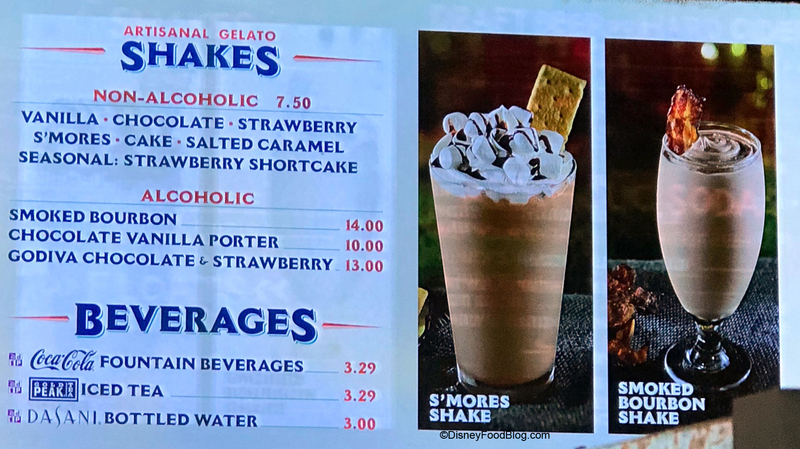 Choices include Pina Colada, Key Lime Pie, Sunset Cruise, Bahama Go Mama, Floating Down the Swanee, and a Cup of Sunshine. 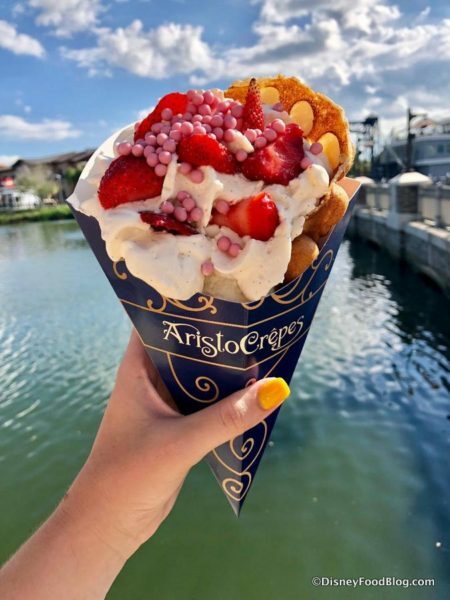 Aristocrepes still offers those amazing Bubble Waffles! 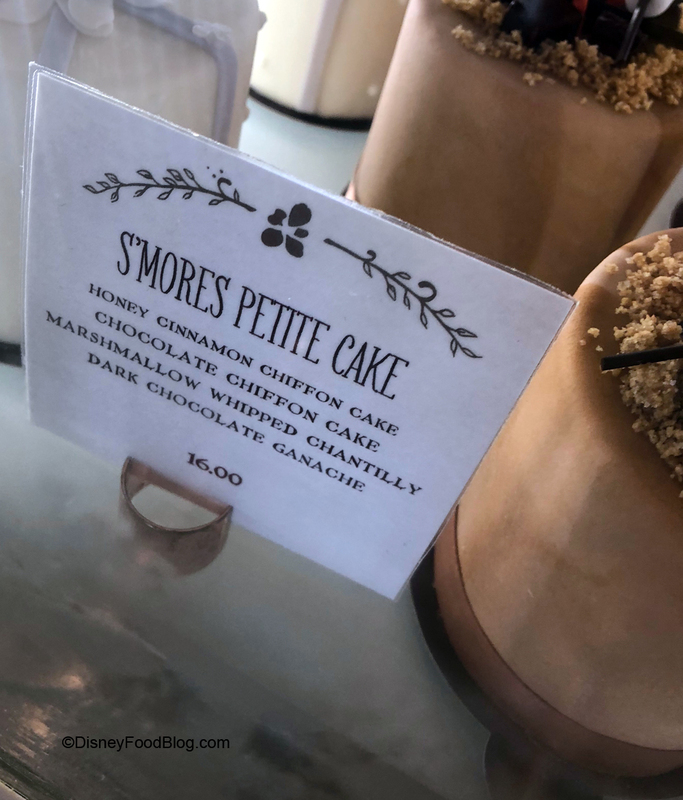 Check out all the details and a full review here, and enjoy the photo below! 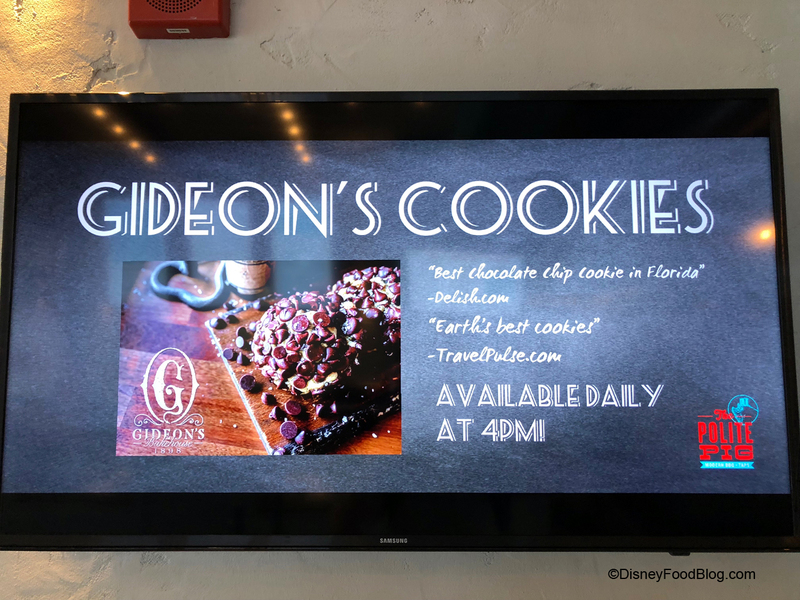 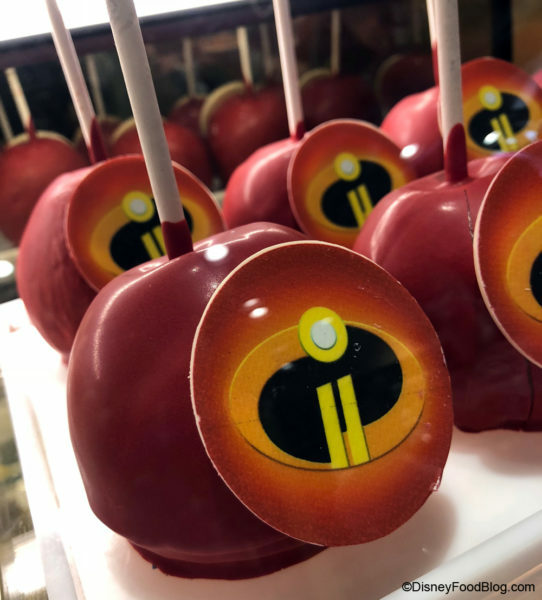 Goofy’s Candy Co. is celebrating the Incredibles 2 movie with a special krispy treat and gourmet apple. 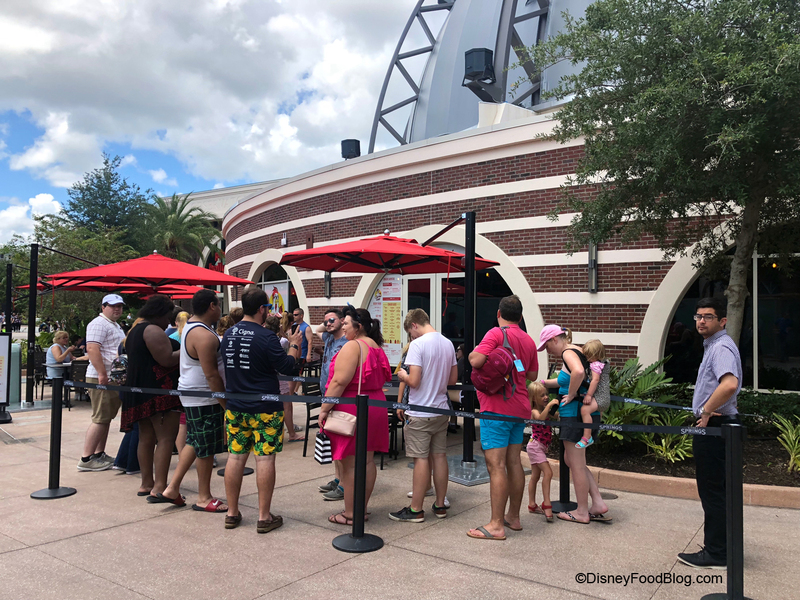 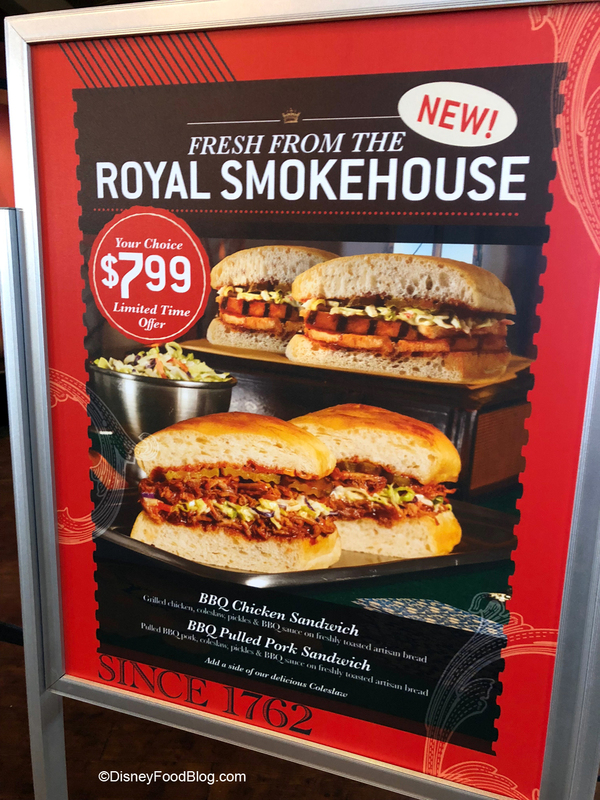 The Earl of Sandwich has whipped up two new sandwiches straight from the Royal Smokehouse: the BBQ Chicken Sandwich and the BBQ Pulled Pork Sandwich. The Earl has also been updating his menu. 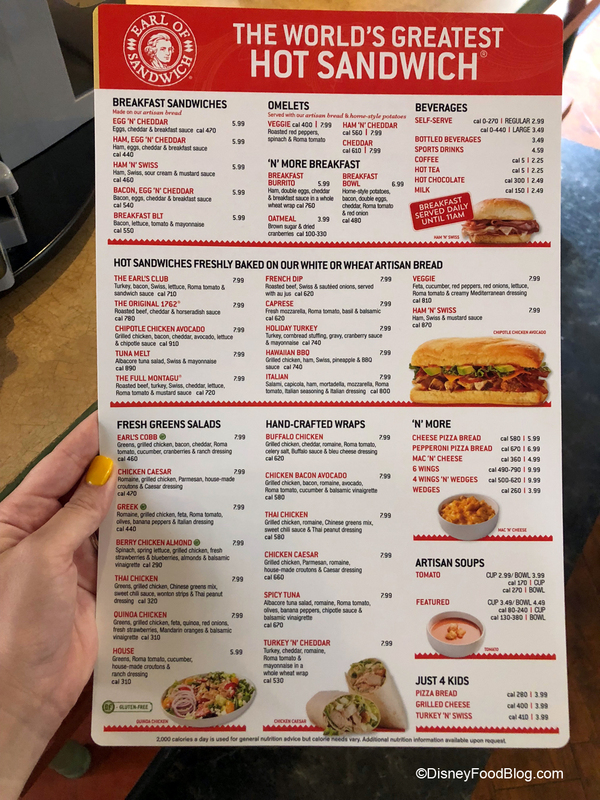 Some items that were available seasonally are now on the permanent menu including: French Dip Sandwich, Quinoa Chicken Salad, and Wings. Incredibles and/or Dole Whip fans rejoice! 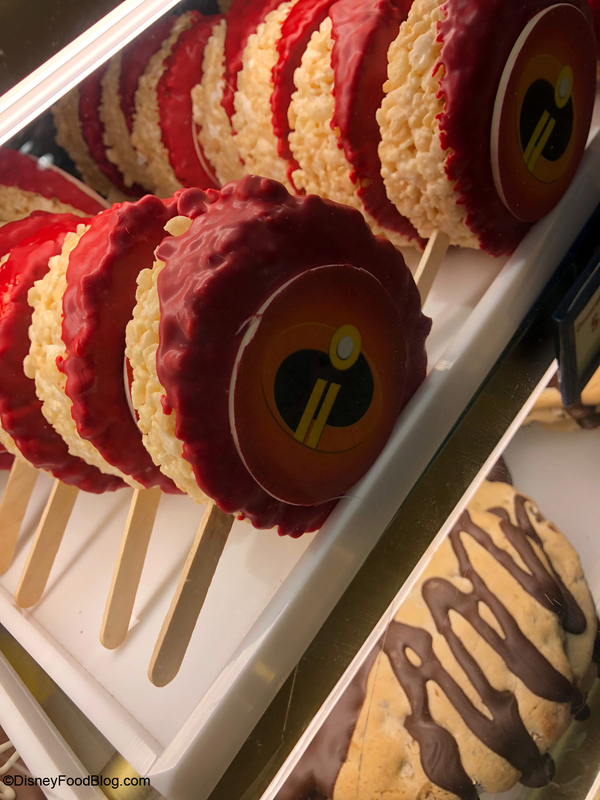 You can now get your favorite pineapple treat in an Incredibles cup at Marketplace Snacks. 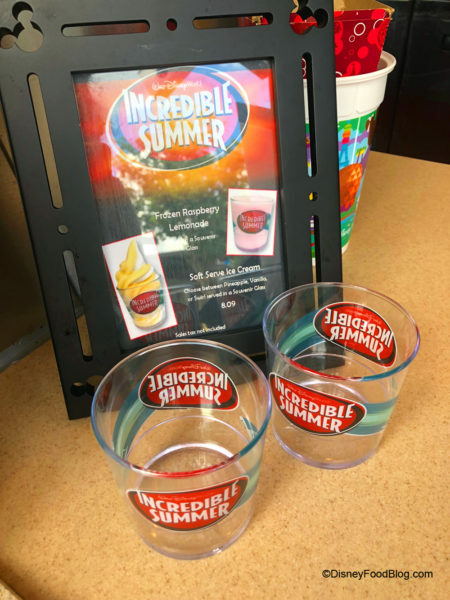 The cups are available at other locations including Aristocrepes and The Daily Poutine. 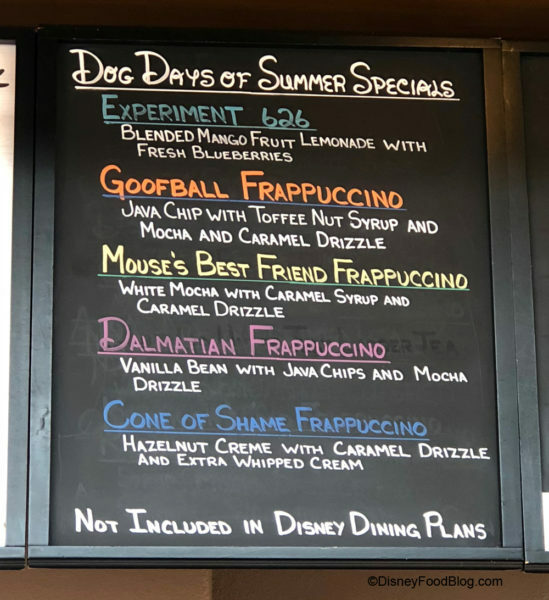 The baristas at the Marketplace Starbucks have developed a fun Dog Days of Summer menu for our enjoyment. 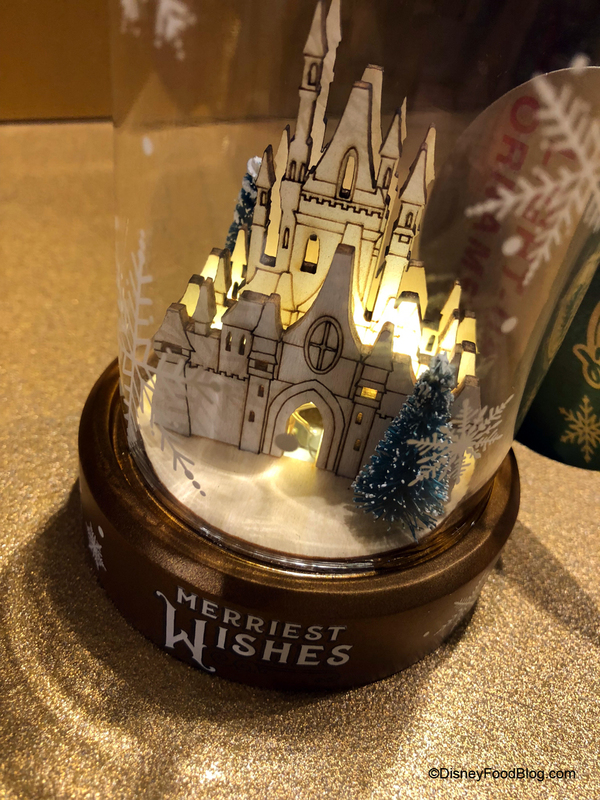 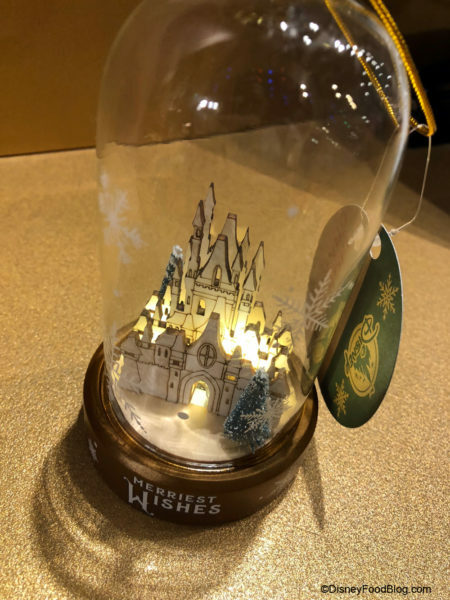 Disney’s Days of Christmas has some new Christmas ornaments in this Beat the Heat edition! 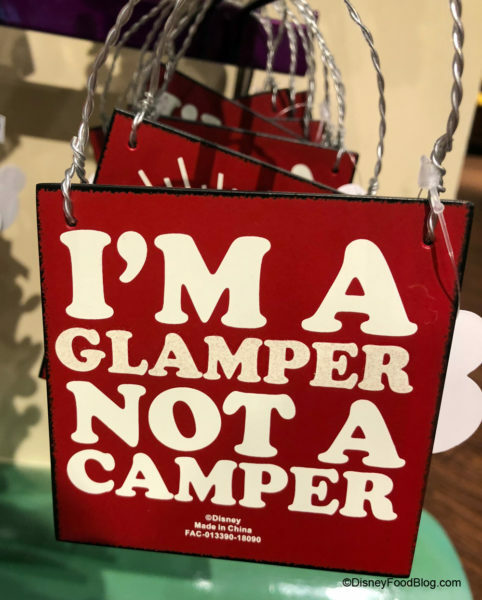 Its never too early to start shopping. 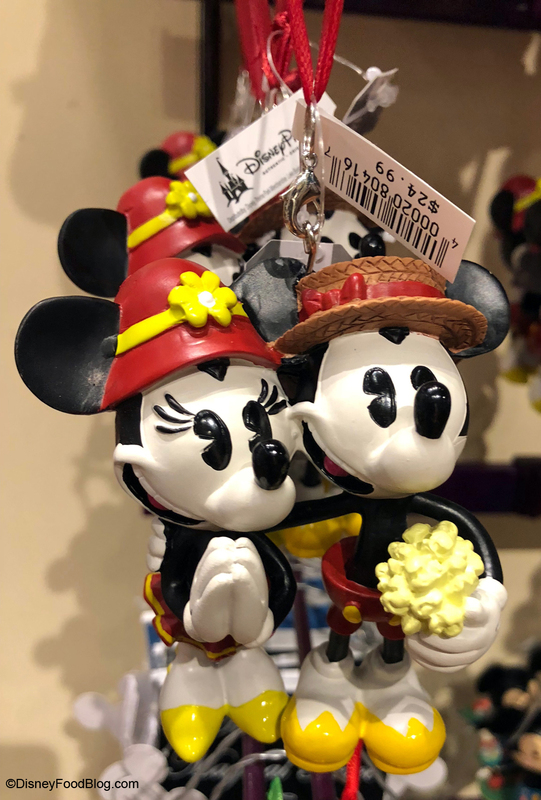 We love this Main Street Mickey and Minnie. Is he offering her flowers or popcorn? 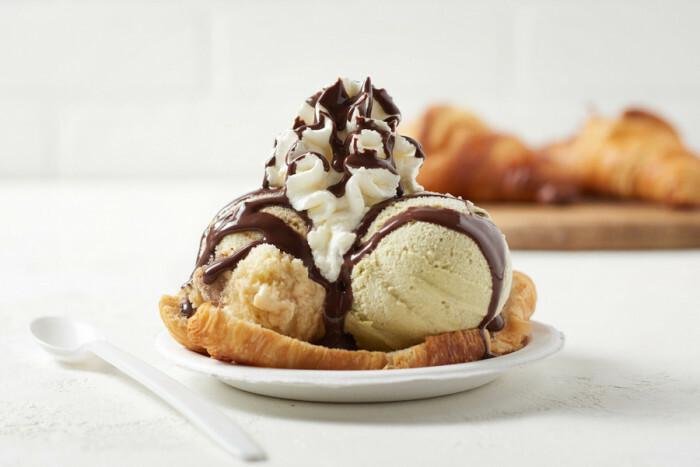 We’re thinking popcorn, but we’re biased. This ornament serves double duty – for those who love camping, and those who would rather glamp. Which are you? Tren-D is, of course, on trend with these new shirts. 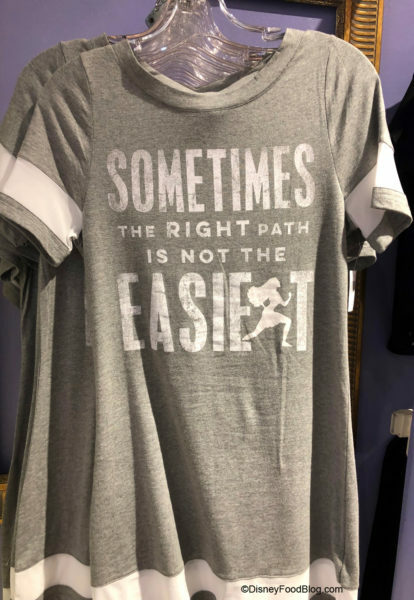 This one is totally #relatable. 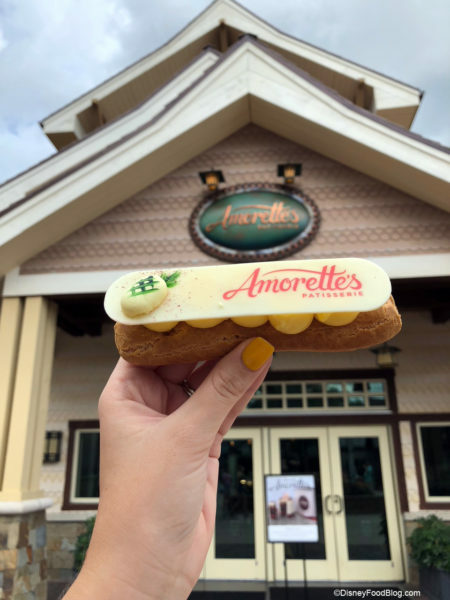 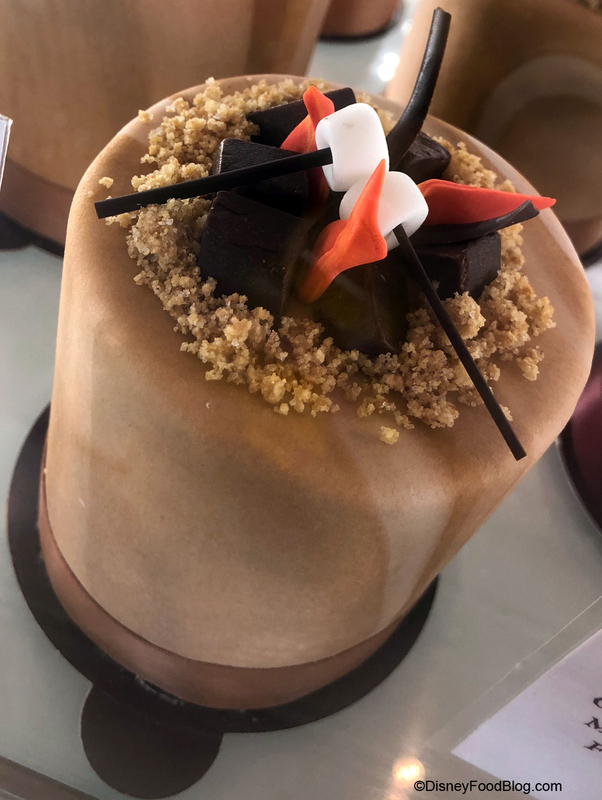 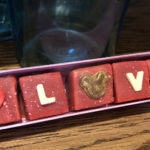 We shared some of our discoveries with you from Amorette’s Patisserie before, but they are worth an extra mention. 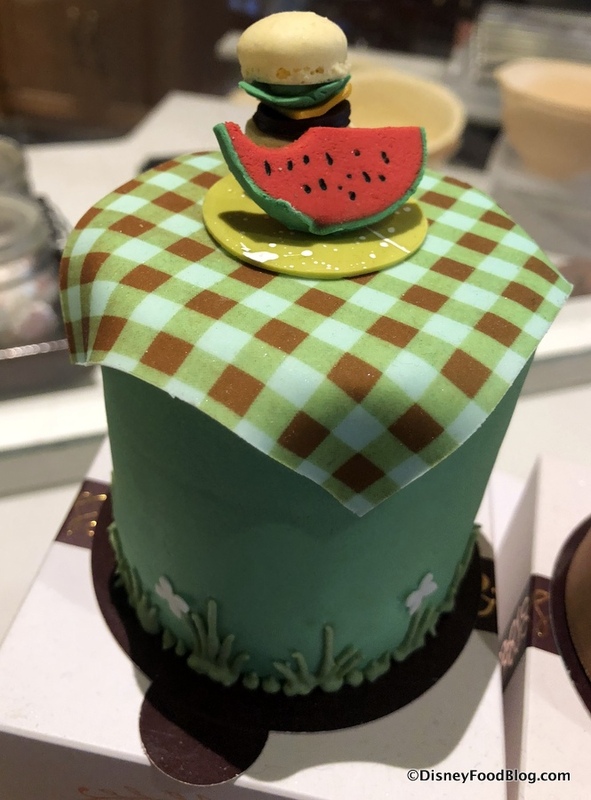 Lets start with the petite cakes just for summer. The Picnic Petite Cake is a Peanut Butter and Jelly flavor cake ready to go on your next picnic in the parks. 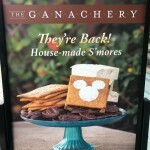 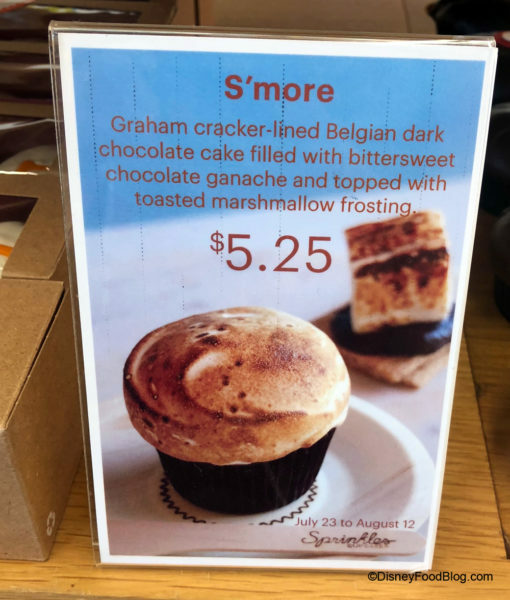 The Campfire Petite Cake is a S’more’s flavor. 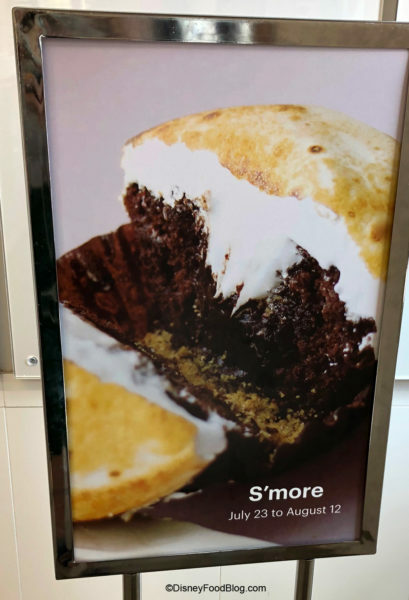 We can imagine roasting mini marshmallows on this mini campfire! We gave you a full review of the new Pineapple Eclair and Frozen Chocolate drink this week. Here’s another chance to admire the handiwork of the pastry chefs at Amorette’s. 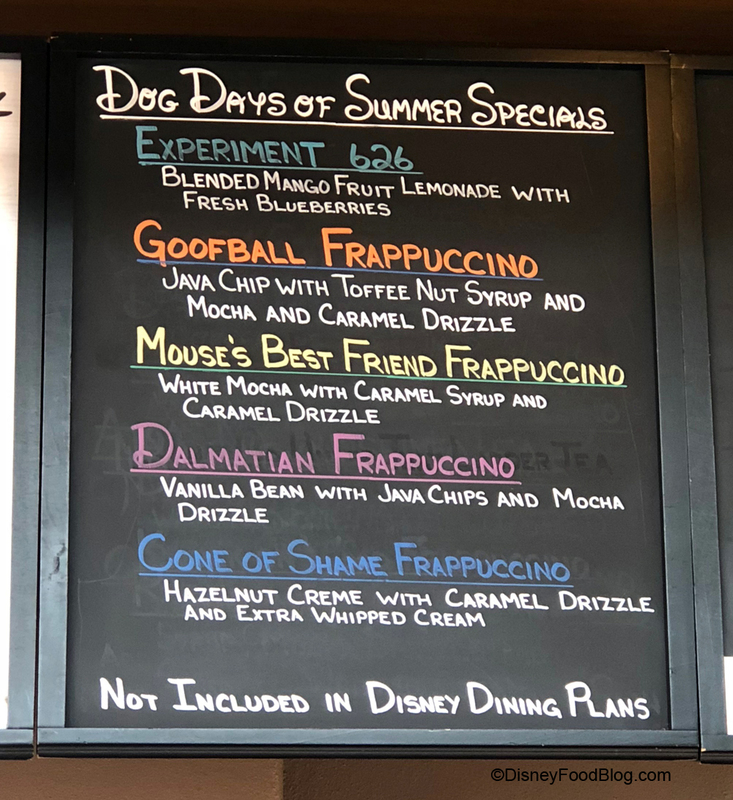 In addition to the new Chocolate Frozen drink there is also a new Frozen Hibiscus Lemonade drink. 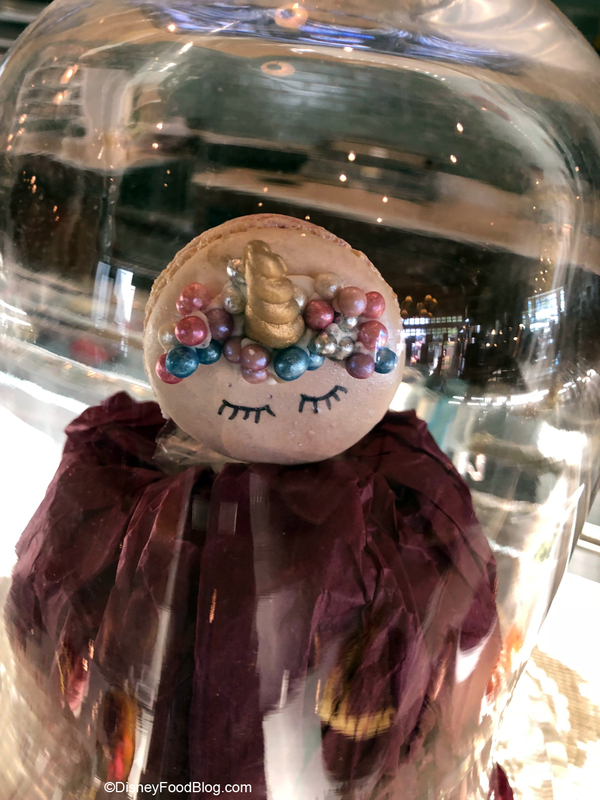 The Unicorn Macaron is still available at Amorette’s. 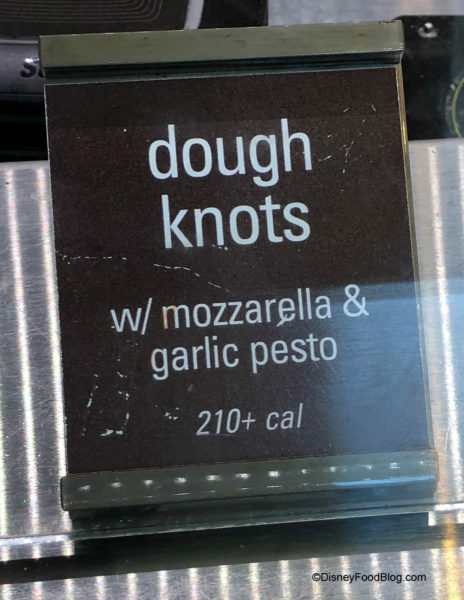 Be sure to try this before it gallops away. 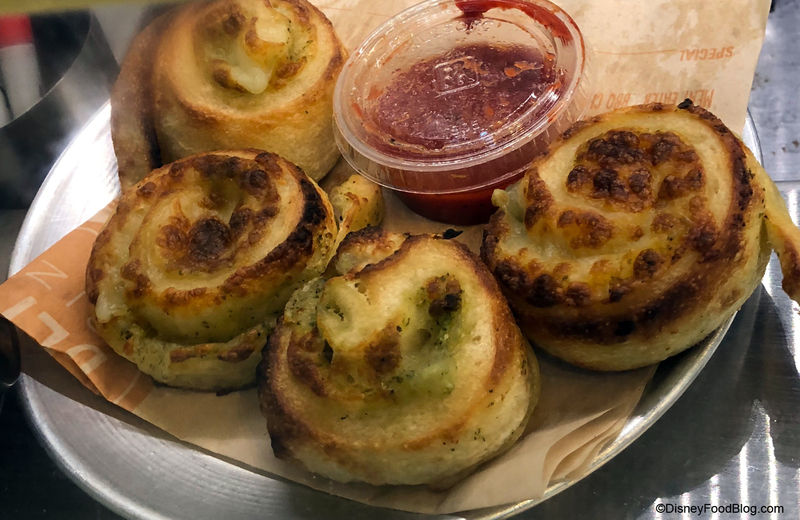 Blaze Fast-Fire’d Pizza has added some Dough Knots to their menu, not to be confused with doughnuts! 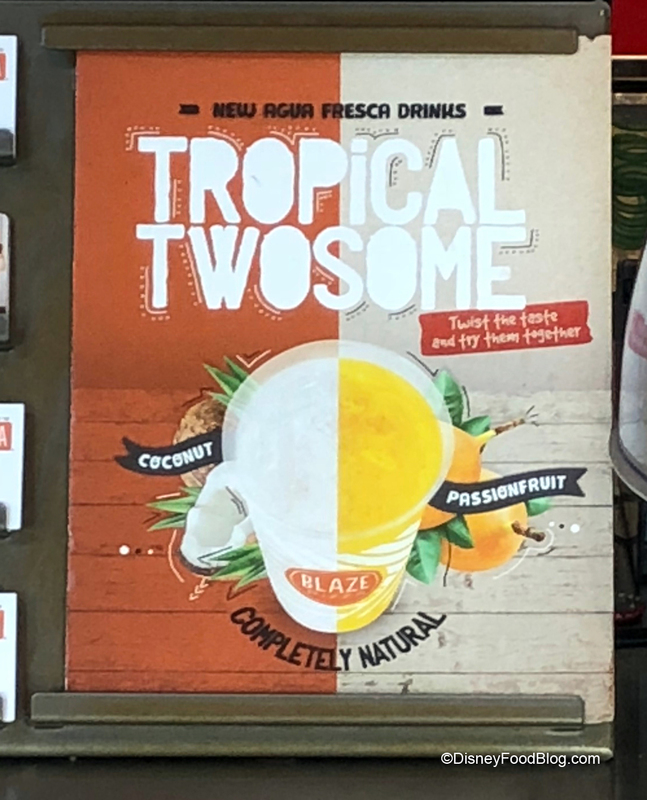 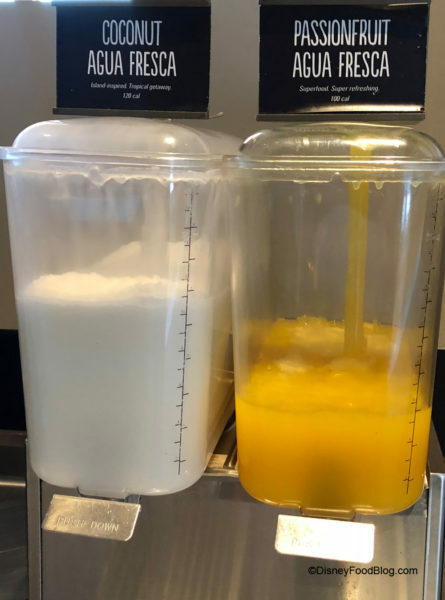 Blaze is featuring two new Agua Fresca Drinks in Passionfruit and Coconut. 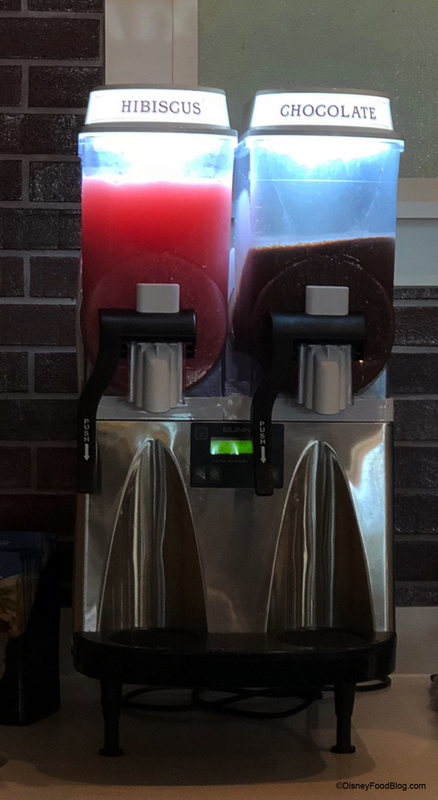 These should help you stay refreshed. 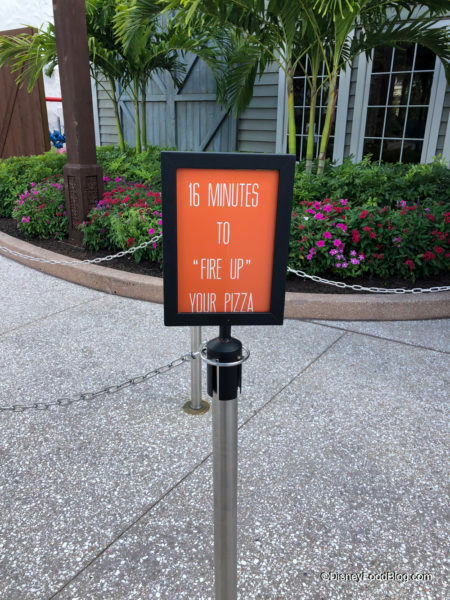 Blaze has become a pretty popular spot and just like some of our favorite rides has now added a queue system with wait times! 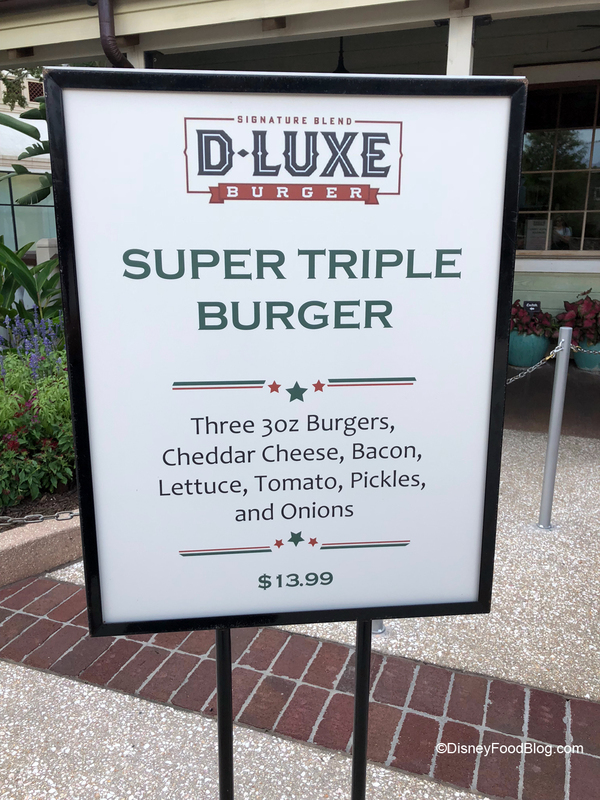 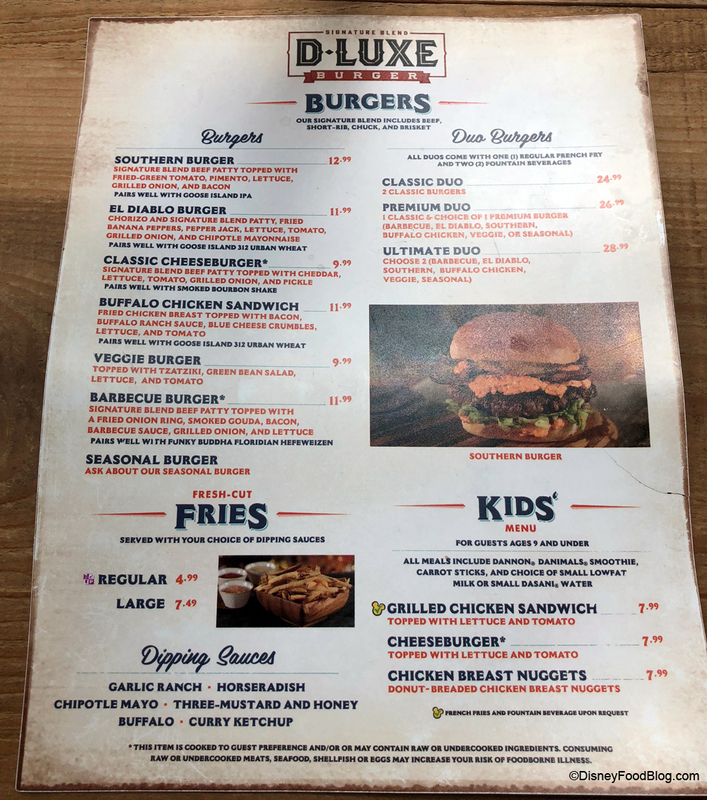 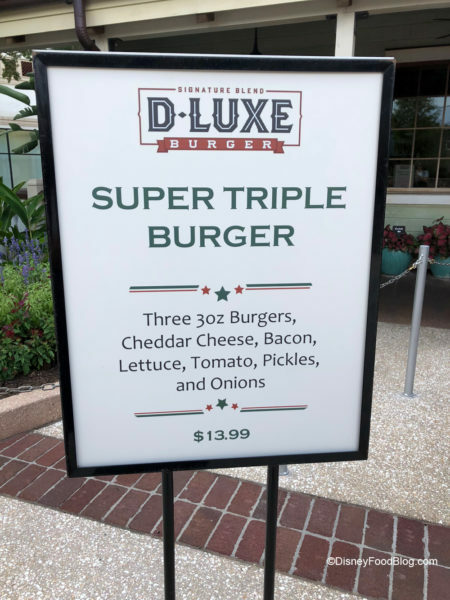 One of our favorite spots for a burger, D-Luxe Burger is offering a seasonal Super Triple Burger and Strawberry Shortcake Shake. 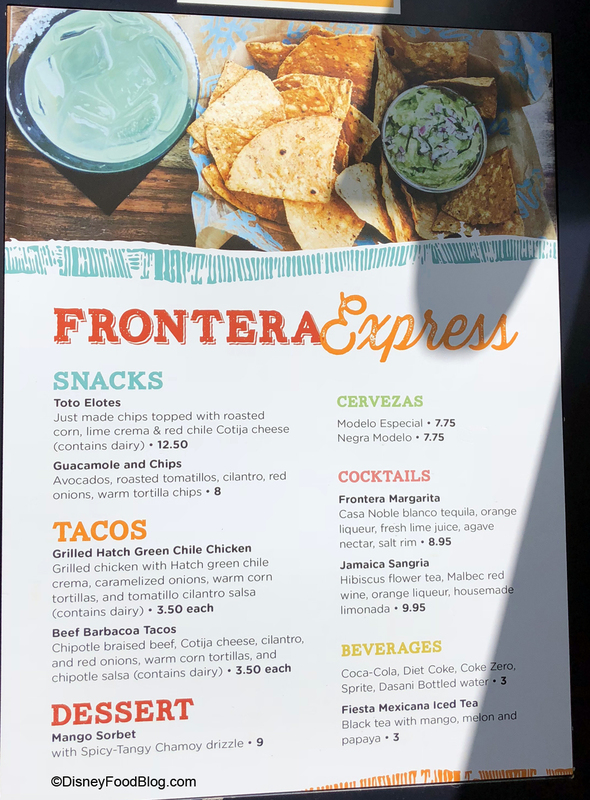 The Frontera Cocina Express Window has added Toto Elotes, Mango Sorbet, Grilled Hatch Green Chile Chicken, and Jamaica Sangria to their menu. 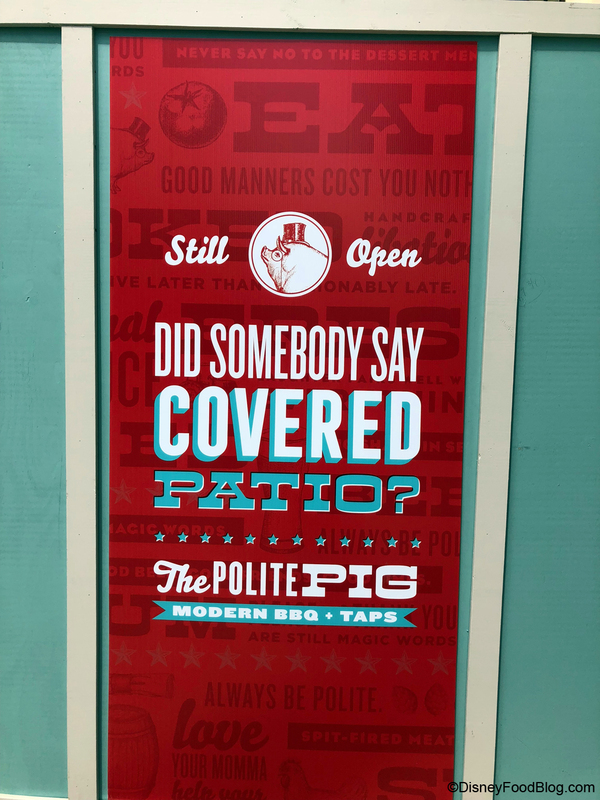 The Polite Pig is renovating their patio area to include covered seating, which will be ideal in sun or rain. But, don’t worry you can keep cool with their seasonal cocktail slushies, Frozen Vodka Lemonade and Passionfruit Frosé until the renovation is complete. 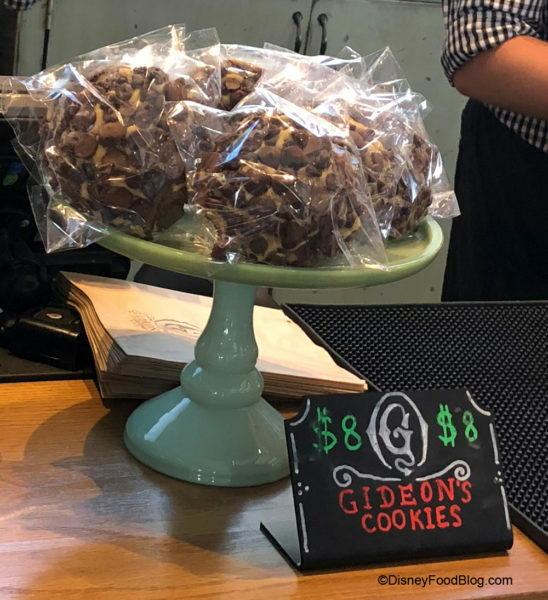 And, yes you can finish off your meal with a Gideon’s Chocolate Chip Cookie at The Polite Pig. 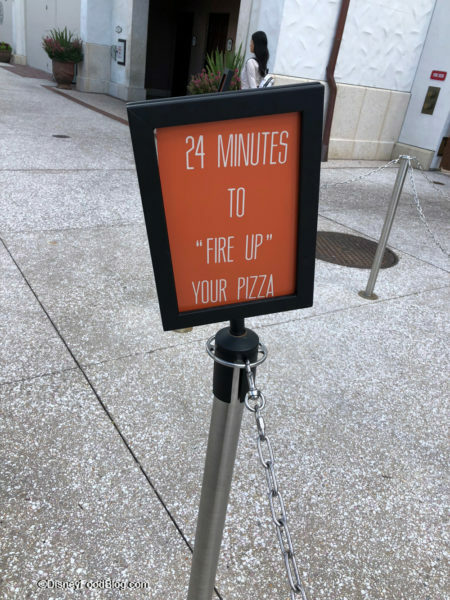 They are now advertising that the are available AFTER 4:00pm. Sprinkles is in on the summer theme as well with a S’mores seasonal cupcake. 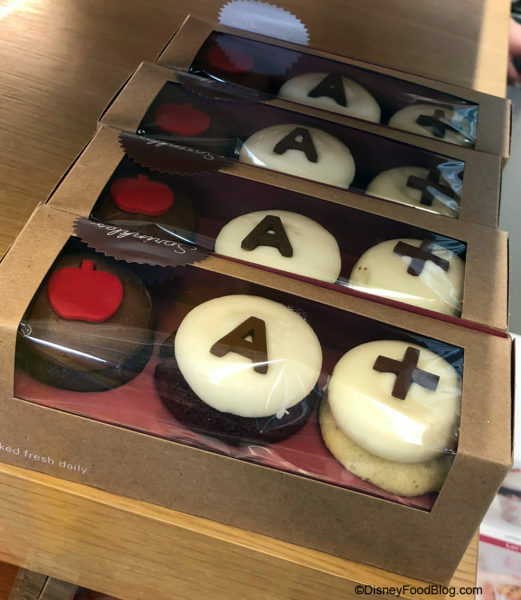 Sprinkles is also trying to ease the back-to-school stress with this cute mini-cupcake set! 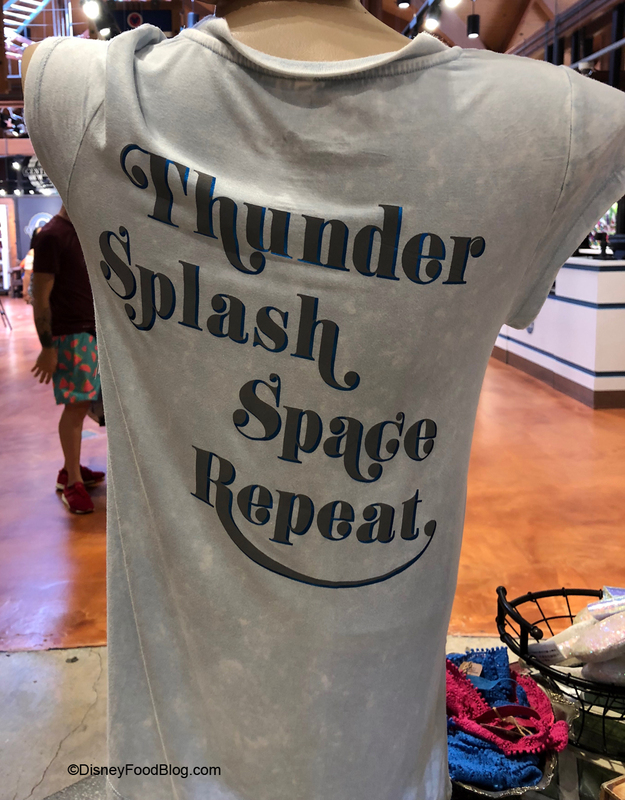 We give it an A+! The covered shops area is now home to a new Pop-Up Bar. 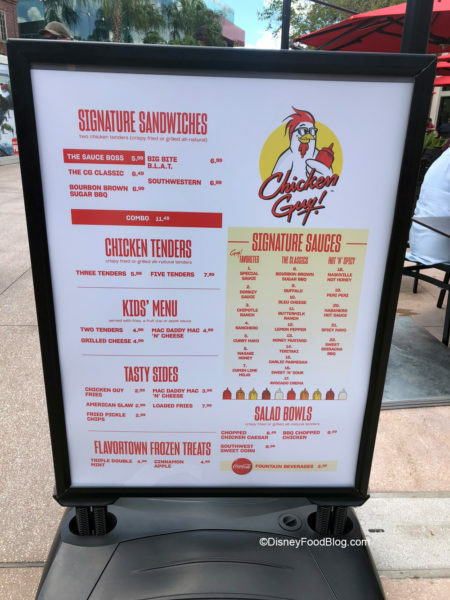 We’ve given you a preview and review of Chicken Guy! 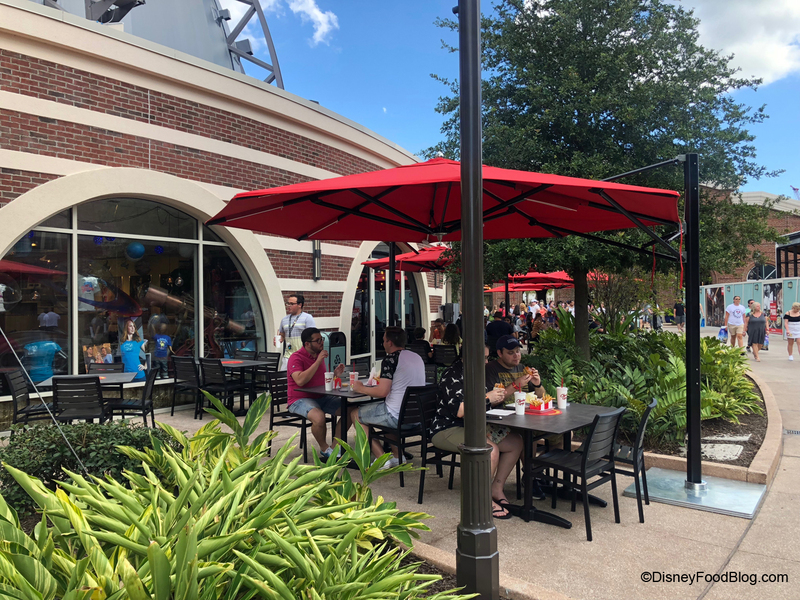 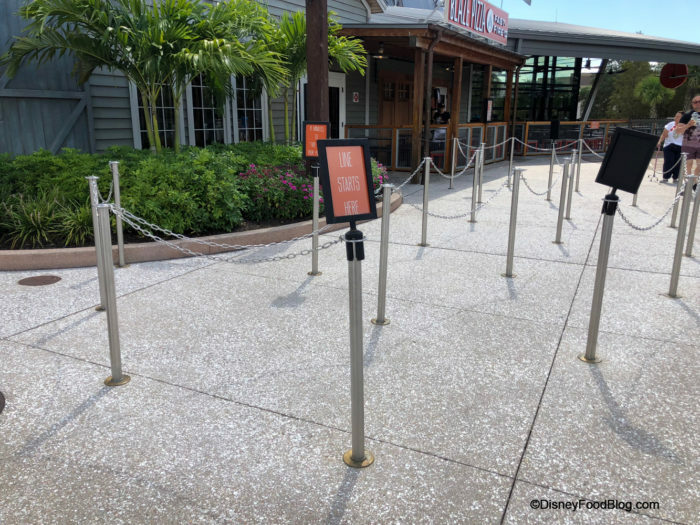 We noticed they have added more outdoor seating to their area and a queue system when we walked by this week. 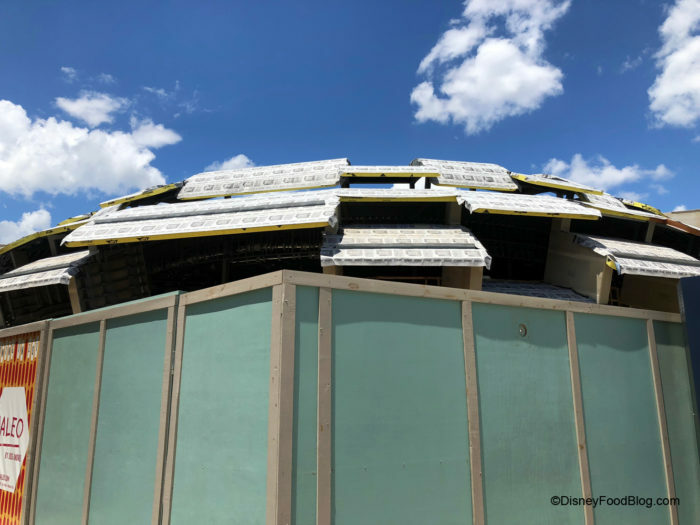 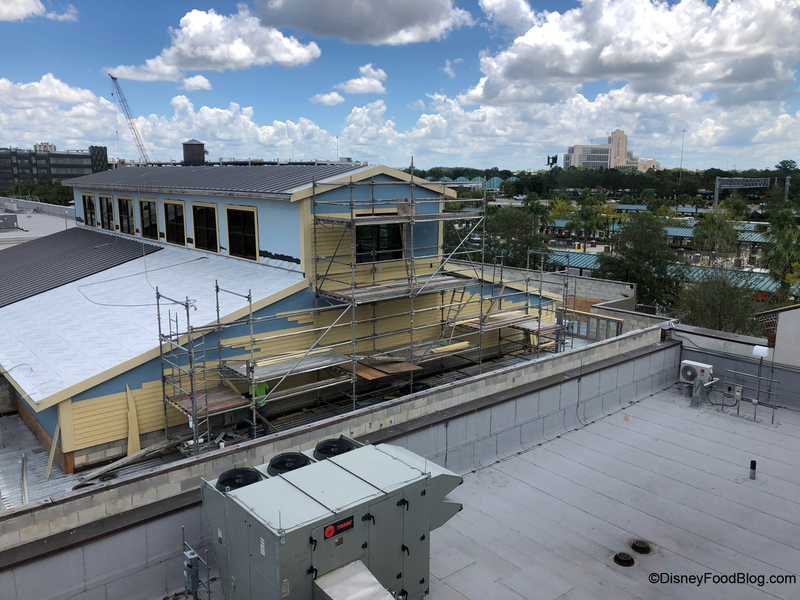 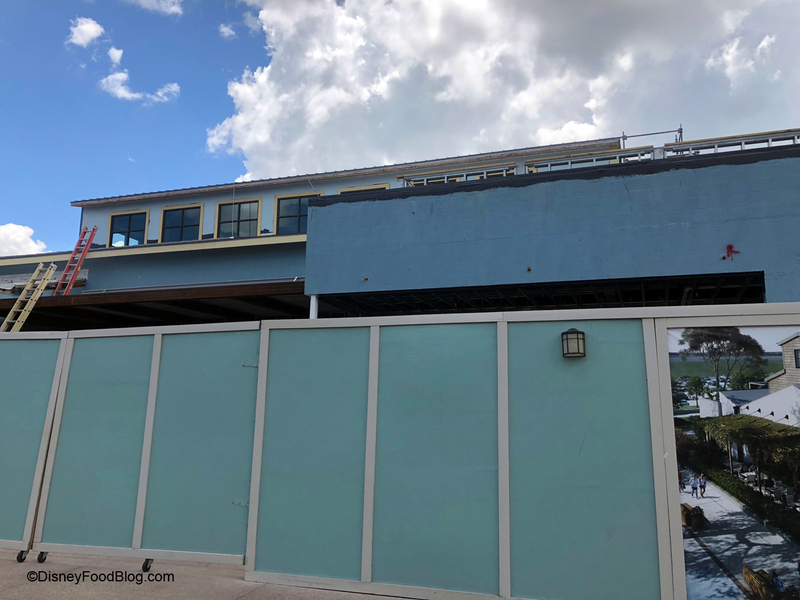 As we prepared to bid adieu to Disney Springs, we checked on the construction progress for Wolfgang Puck Bar & Grill. 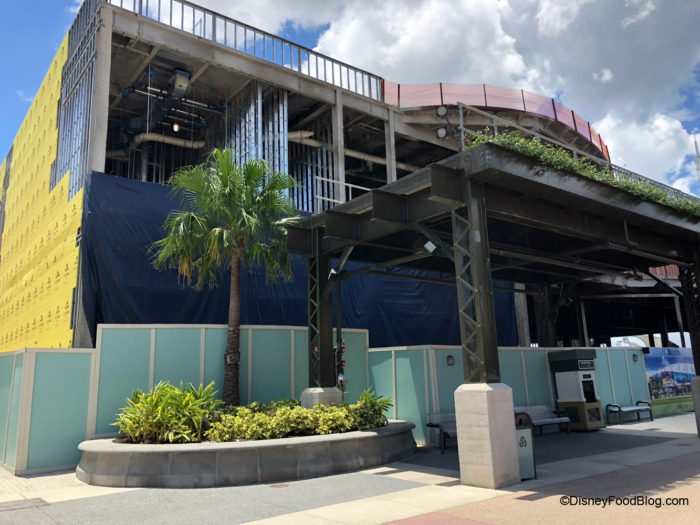 This location is expected to open in 2018. 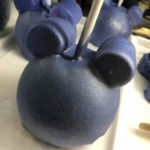 « Sneak Peek! 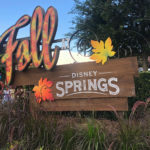 Epcot Food and Wine Festival Wine and Dine Half Marathon Medals! That was a great post, AJ. 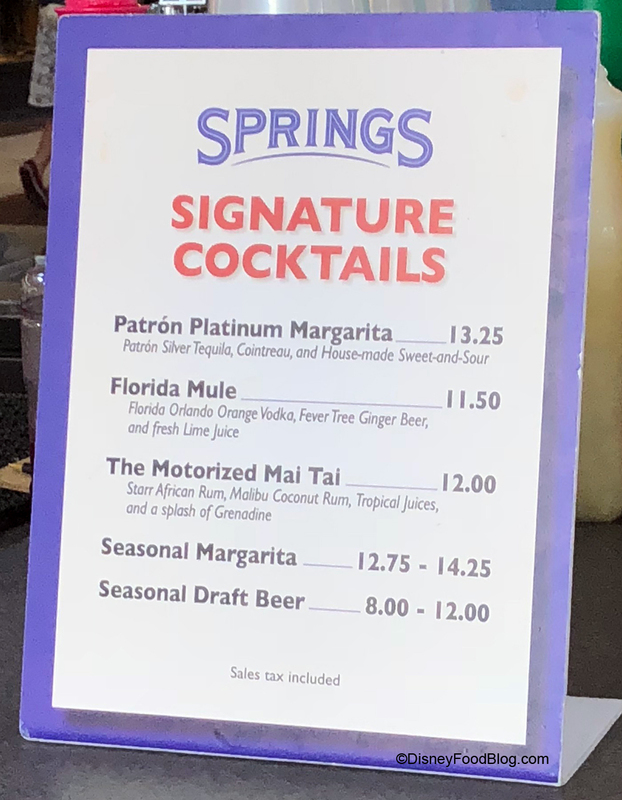 I would love to have a snow cone with lime and orange as well as some of the cookies, and the S’mores cupcake, but I was upset when I saw that Do a did away with my must do fave the All American. 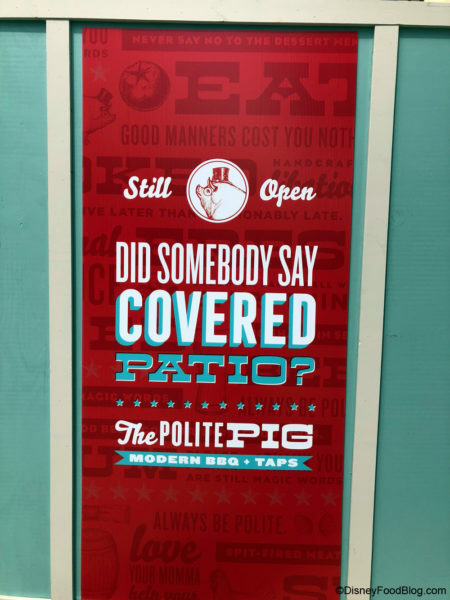 I felt much better when I read that it could be requested! 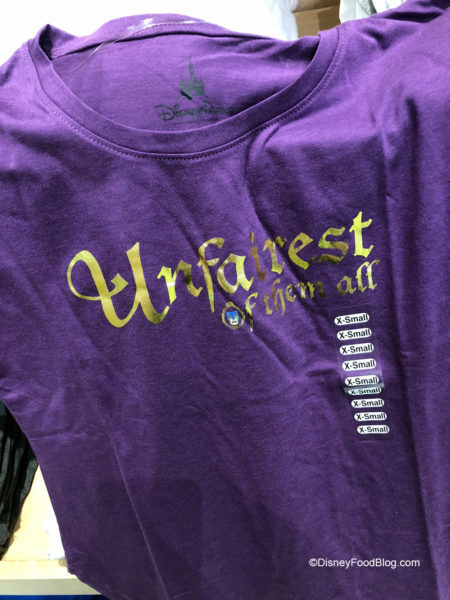 I really wish, however, that start making some of the old fashion quality full length tees with embroidery that don’t already worn out. At least a few, for us size 12 guests who can’t wear the skimpy short crop tops. 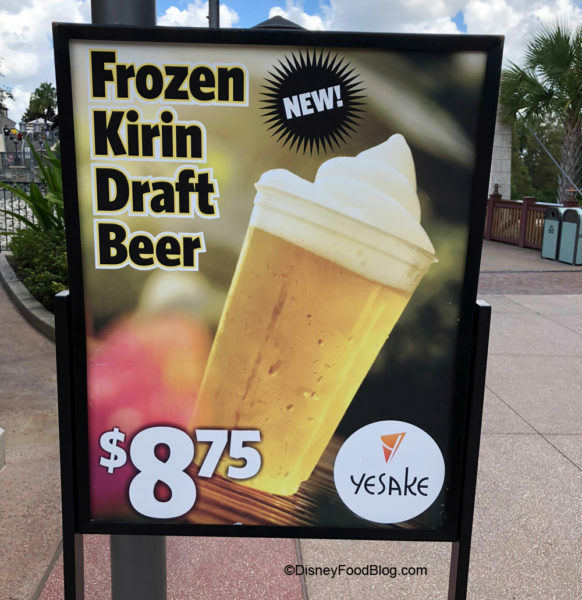 Is the “frozen” beer at yesake the same one you can get in Epcot at Japan? Wendy, we’re pretty sure it’s the same!